One of the earliest things you learn about at art school, is trompe l’œil, a favourite of teachers and students alike it is a celebrated demonstration of artistic talent. Besides, students love the chance to be cheeky. “Rembrandt’s students are reputed to have played a cruel joke on the great master when they painted some highly realistic gold coins on the floor of his studio. The great master was forever poor and much in need of funds, and so his pupils hoped to trick him into scrabbling around on his hands and knees trying to pick them up” 1. 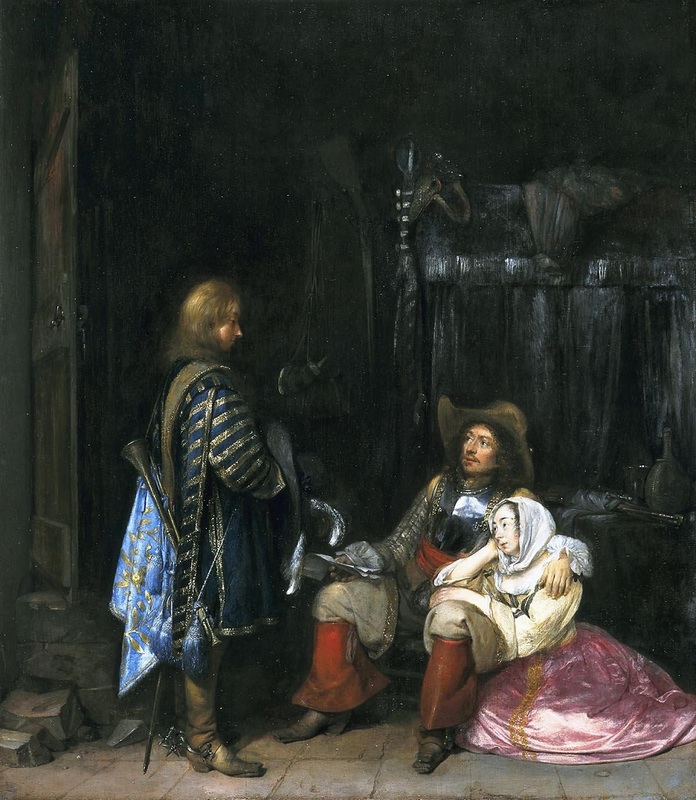 As mentioned in a previous article, the illusion of having drapery or a curtain partially covering a work is a time-honoured favourite of many artists. 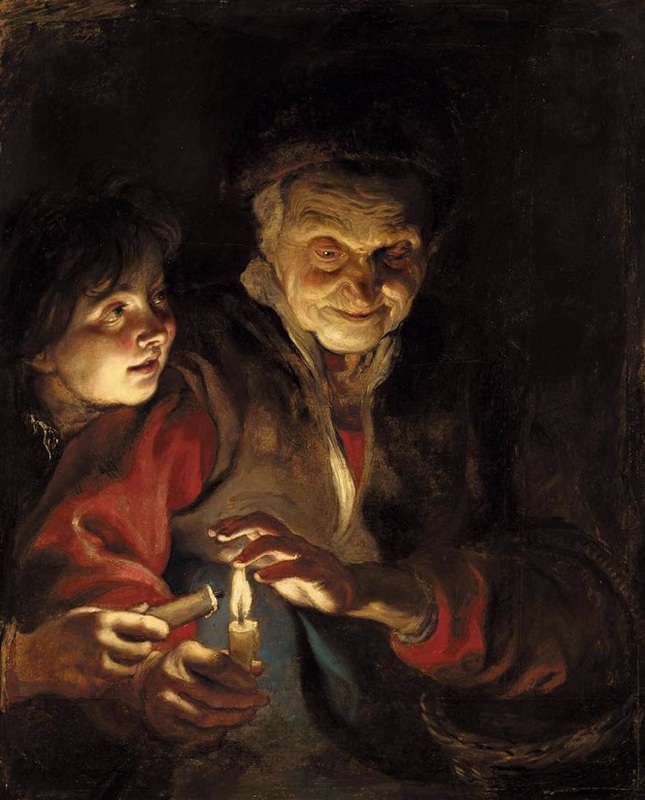 The Dutch Golden Age is a treasure trove of trompe l’oeil curtains, but the tradition dates back through a boom in early Christian artwork, but the origin story is given to us of course, from Ancient Greece, wherein two skilled artists submitted a painting in competition. “Zeuxis produced a magnificent still life, which featured grapes that were so lifelike that a bird flew down to peck at one. Not a bad result. However, Zeuxis unwittingly and by implication admitted defeat when he turned to his rival Parrhasius and asked him to draw back the curtain of from of his own painting in order to reveal its subject in its entirety” 2. So in my early art student days I too was enamoured with the illusion and trickery of a trompe l’œil, admiring above all the proficiency of the craftsman to create something in two dimensions which your eye believes is three. Creating, through skill, a challenge of our senses and our perception of the world. 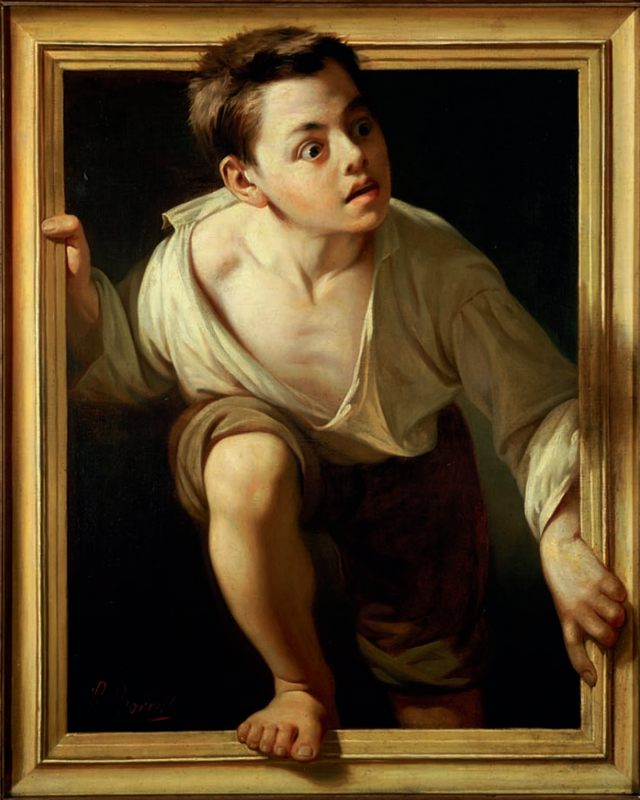 There are many fantastic examples of trompe l’œil throughout the ages, one of the most beloved being Escaping Criticism by Pere Borrell del Caso, 1874. However, the example given to me, which sparked a great passion in my heart, and of which I had the utmost privilege of beholding in person recently, The Goldfinch (Carel Fabritius), 1654. 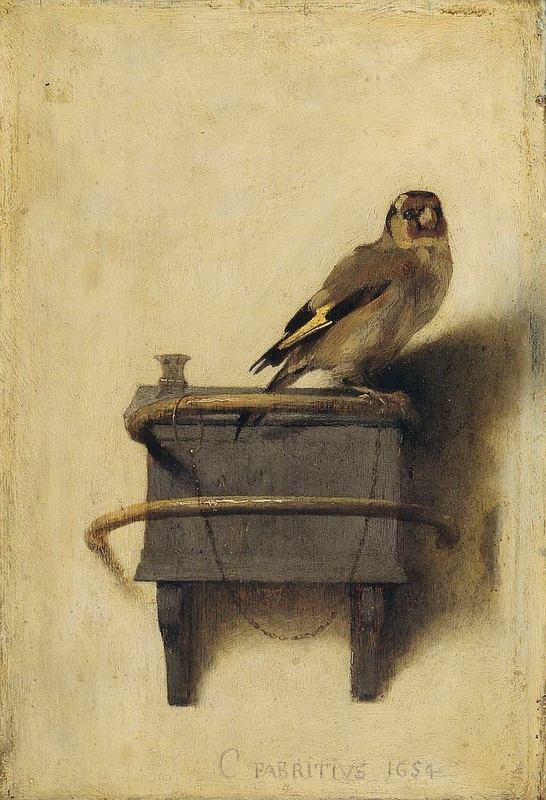 The Goldfinch (Carel Fabritius), 1654. When the Maruritshuis was under renovation during my first trip to Holland, I was so disappointed to have missed the opportunity to view some really wonderful artwork. When I returned home I found out that a “treasures” collection had traveled to North America and I considered making the 10 hour drive to get a peek at the collection when it arrived at the Frick. My patience was rewarded last fall, however when I went back to view the entire collection at the newly opened Mauritshuis in the Hague. 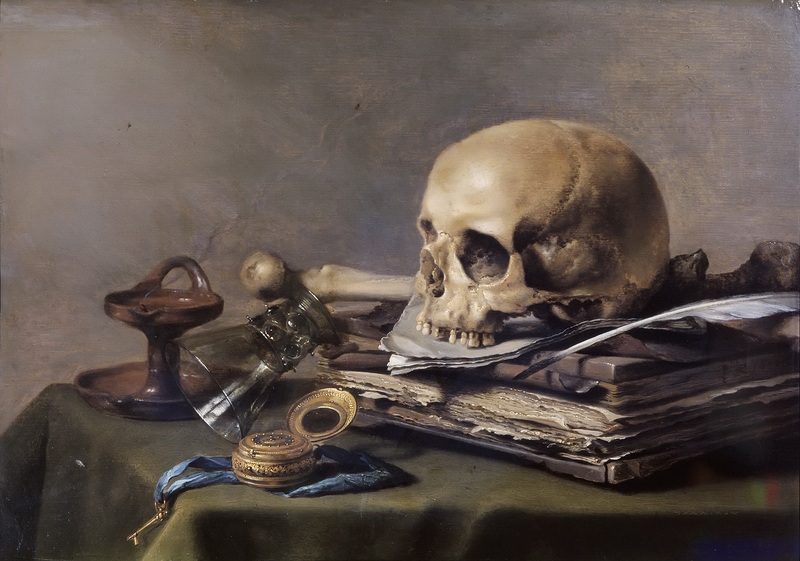 On a quick sidenote, I always love looking for digital images of paintings. 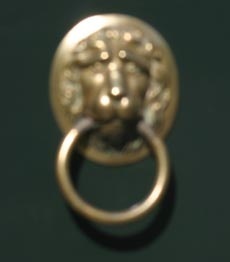 Ideally you can find an extremely high res version supplied online by the museum, but sometimes it’s quite hillarious to do a google image search. For very famous paintings, you will find all sorts of stuff showing up. For example, if you google image search the Mona Lisa you will find a great number of hillarious chops. But when you search for a small painting which is fairly unknown to the public but much beloved by art aficionados, this is what you get. Zillions of copies of the same image, uninterrupted. All with slightly varying levels of colour and contrast, depending on who took the picture and what they did to it. The Goldfinch is a small painting. It’s only 13.2 by 9.0 in (33.5 by 22.8 cm) but I hesitate to refer to it as very small, in context. It is painted on very thick board, which is speculated to have been part of a cupboard door or panel 3. It displays a goldfinch, atop a wall perch, its captivity evident by the thin chain which attaches it. “In the 17th century, goldfinches were popular pets because they could be trained to draw water from a bowl with a miniature bucket. 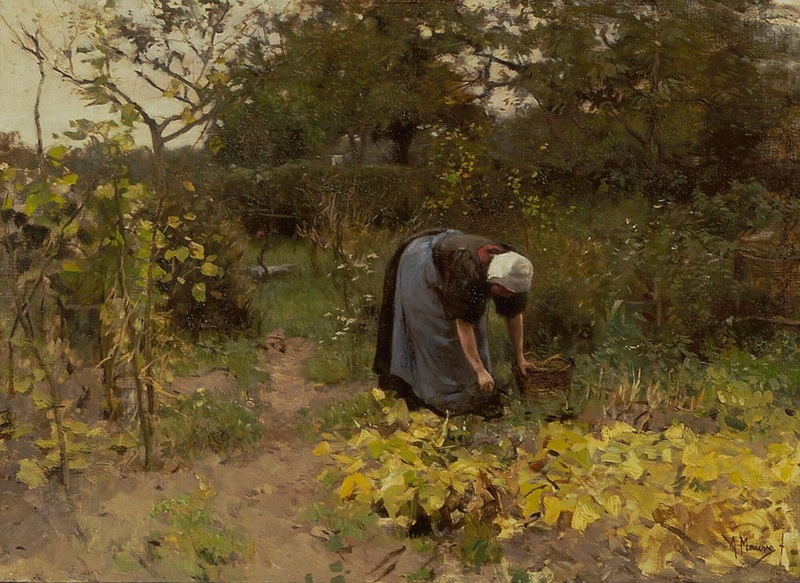 The Dutch title of the painting pertains to the bird’s nickname puttertje, which refers to this custom and translates literally as ‘little weller’” 4. Fabritius leaves very few paintings to us, perhaps only a dozen. He died young, perishing along with most of his paintings in a magazine explosion 5. However a very distinct personal style was carved out in his few years, the few remaining paintings marked with simple beauty in quiet and solitary moments, beautifully presented in impressive perspective and wonderful palette. Fabritius can be considered the stylistic connection between Rembrandt, his master, and Vermeer, his pupil. 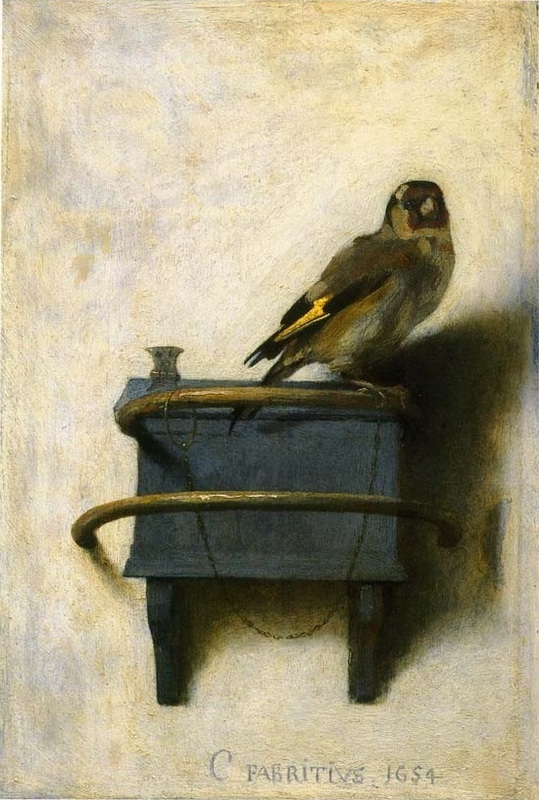 Fabritius experimented with perspective and lighting, both expertly executed in the Goldfinch. 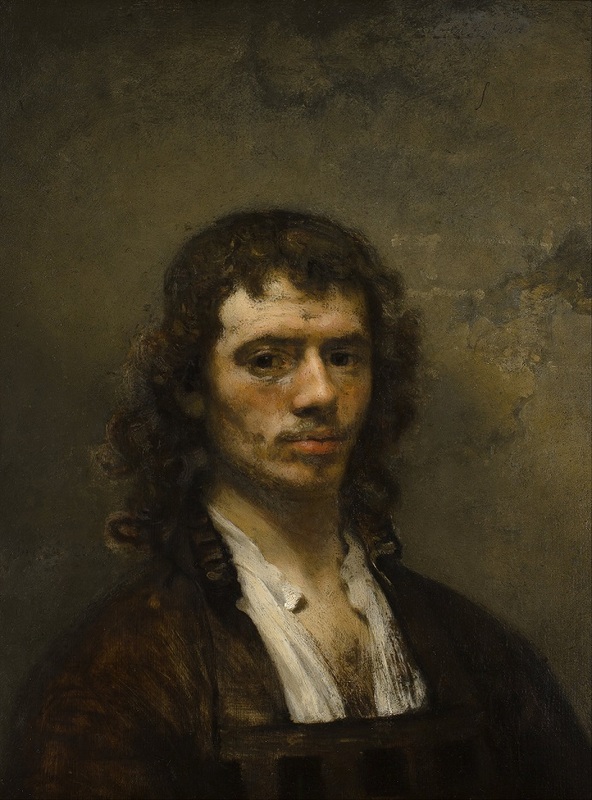 Though the majority of Rembrandt’s pupils emulated his style, Fabritius was interested in delicately lit subjects with bright, warm backgrounds, while retaining the gestural brushwork of his subjects. The uniqueness of Fabritius’ style which in turn inspired Vermeer is his honest and unembellished observation of the world around him, giving faithful devoted attention to the lighting and feeling of the scene. “Moving away from the Renaissance focus on iconography, Fabritius became interested in the technical aspects of painting. His personal style is “marked by an exquisite feeling for cool colour harmonies and (even though he often worked on a small scale) unerring handling of a loaded brush” 6. “He painted the goldfinch with visible brush strokes. The wing he indicated with thick yellow paint, where he put in with the back of his brush a scratch” 7.
get back! I’ve got a fully loaded brush! Fabritius also experimented with spatial effects and forced perspective. A major goal of Dutch paintings at the time, especially those to be hung in homes for personal use, was to blend with the room. We can imagine the work hanging on the wall, or perhaps inlaid into a cabinet door, hearkening at the simple homely visual of the captive pet, the thick paint vibrating with intensity in emulation of the birds little heart, the glint of light off its round eye, and streak of black and yellow a familiar visual cue. The gestural application of the paint and the commonality of the subject matter gives the viewer the impression the painting hanging on the wall is instead a glimpse of the real thing. Like the wall calendar by the phone in the kitchen, it’s a familiar and homely element, something we are used to seeing out of the corner of our eye without taking time to observe it closely. 1, 2 Green, Malcom. “Book of Lies” London: Essential Works, 2005. 3 Frederik J. Duparc, “Carel Fabritius (1622-1654) His Life and Work” in Carel Fabritius 1622-1654, Zwolle, 2004. 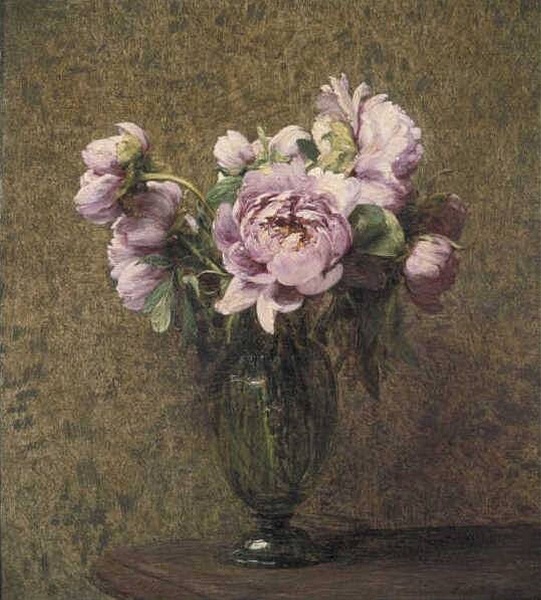 Paintings of flowers are generally the most approachable works. There is rarely a complex story to read in the details. Instead, the purpose of the work is just an attempt to portray the beauty of the object, the fleeting nature of its existence, or the impression you feel when you observe them. Take for example your average Dutch Golden Age floral painting; it contains exquisitely detailed technique and keen observations, each delicate blossom frozen in time. Or for example, an Impressionist garden or floral scene, the nodding blooms painted with a vibrancy and dynamic quality which mimics the way you observe them. 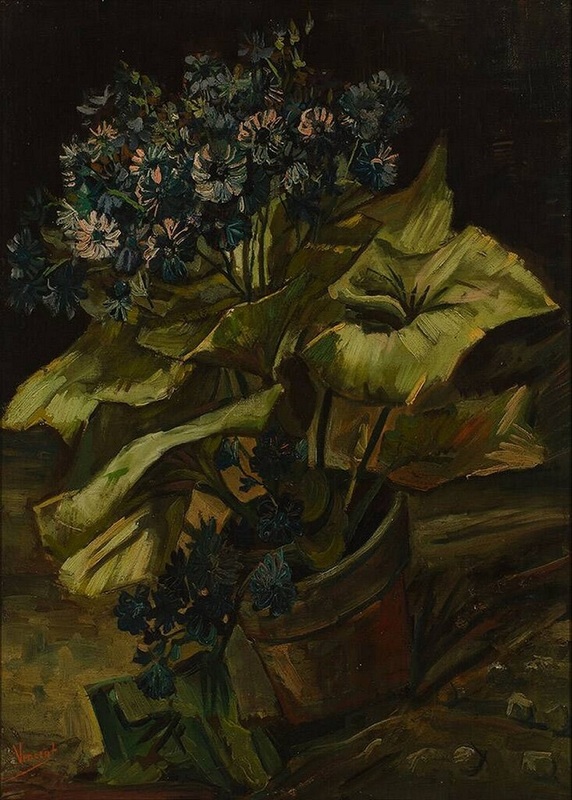 However, today I want to talk about a floral still-life which breaks these notions and instead offers an emotional and deeply complex read : “Cineraria in a Flowerpot” (van Gogh), 1886. Van Gogh is well known for his emotionally-charged works painted with swift and gestural execution. I used to think that van Gogh painted things without care for their detail or true likeness. If you spend more time with his work, and his biography, you begin to see that van Gogh painted the exact amount of details he wanted you to see, in fact he painted only what was important to the story. Everything else got in the way. Van Gogh was also known for selling only one painting during his life, often relying on his brother, with whom he had a very close relationship, for support and sponsorship. His life was often chaotic and unpredictable, due to poverty and mental instability, among other things. So his subjects are not often of the richest variety. They are sometimes sad and lonely, figures and objects in singularity, often rich in meaning parallel to his own life. Cineraria, which I got to spend some time with at Boymans van Beuningen gallery in Rotterdam, was painted during a period where van Gogh lived in Paris under the support of his brother, Theo. During times of financial insecurity van Gogh often directed his gaze at cheap still-life objects such as flowers as he could not afford models 1. His focus of floral paintings during this time are partly due to practical aspects, but conversely seen as an attempt to lighten his palatte and his perspective 2. His brother suggested to him he paint something of lively subject and colour ie)the cineraria, to cater to the taste of potential buyers 3. What is different about this work than some of the other floral paintings, is its unnatural and awkward perspective, as if the flowerpot itself is tumbling forward. The colours are very dark and muted, as if to counter your preconceived notion of a flower. The choice of flower itself, the cineraria, a low shrubby plant, lacking ornate or showy qualities. This humble and lowly plant finds no nourishing beam of sunlight, instead is confined to darkness. It fills the frame.. in fact is barely contained by it, which acts to both illustrate the overwhelming importance of the object, and to hint at its unhappy confinement. The muted colours of the plant are tinged with grey and yellow, exemplifying the withering of the plant, his situation and his outlook. Continuing the theme, I offer another painting for consideration, “A Pair of Shoes” (van Gogh), 1886 from the van Gogh museum in Amsterdam. This is another painting which by observing and painting a simple object but choosing which details to concentrate on, gives the viewer a deeper understanding of the underlying story of the work. 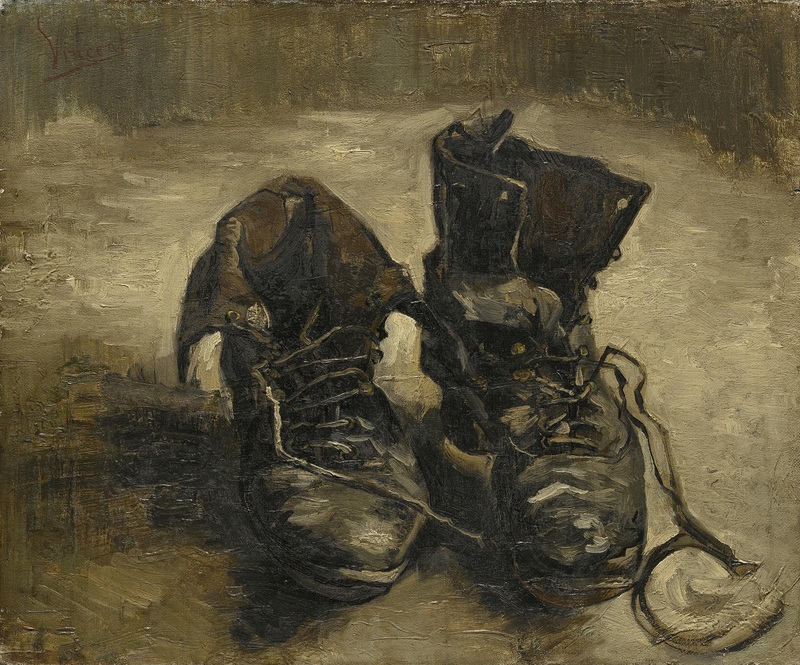 Van Gogh bought the pair of work boots at a flea market in Paris, possibly because he needed shoes, but I lean toward the more romantic notion that he just liked the impression he was given by them. Plus they didn’t fit him at all. “He wore the boots on an extended rainy walk to create the effect he wished for this painting” 4 and afterwards used them only as a prop. The shoes are unlaced, the right shoe flopped open as if they were just removed. They exist in a timeless and uncertain space, as if to imply they could belong to anyone. The shoes, worn with age and use, tarnished with mud, sigh quietly as they are discarded from the tired feet of some faceless workman. They represent age, and fatigue, but also the wilting away of life and mental vitality. 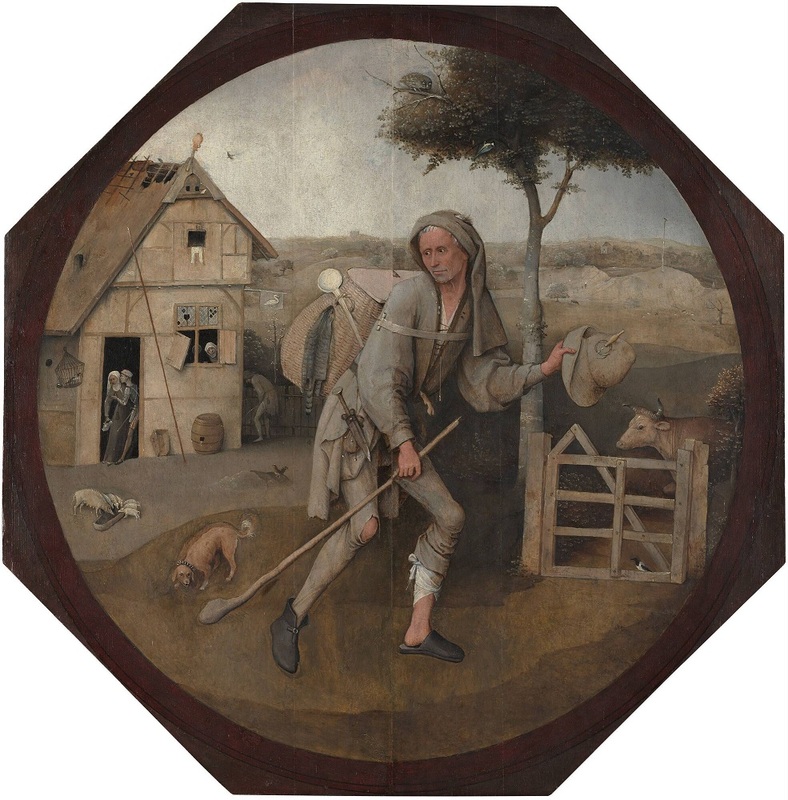 The painting is both a tribute and a dirge to the working man. As with the cineraria, the painting could also be symbolic for Van Gogh’s “difficult passage through life” 5. Closing in on December, we managed to pack up our little apartment into two overweight suitcases. The days counted down into the single digits until we arranged our meeting to return the apartment keys and pay for broken wine glasses. The horribly humid, yet cold and drafty apartment was thoroughly bleached to remove all trace of mold growing behind the damp furniture. Not our problem, I thought.. but still we could use our deposit back. Inevitably the toll of bleach and mold took their toll and I felt unnecessarily sick on travel day. C’est la vie. Navigating the expansive Paris train system one last time we made it to the airport and spent our last Euros on overpriced sandwiches, using up our last bit of change for the uncustomary tip. A long dry but uneventful plane ride later we landed in Toronto. Leaving the plane we cracked open the backplates on our phones to switch back our SIM cards to text loved ones, “We’re home”. I keep getting asked if I miss Paris, having barely enough time to process my place in the world these last few weeks. I’ve indulged in many Canadian comforts, such as dirty take-out pizza and timmies. I wouldn’t say Tim’s has good coffee; the coffee tastes like industrial warming plates and the cardboard cups it comes in, but tinged with Canadian kindness, commonality.. and liquid sweetener. The mid-sized walk-up apartment buildings of Paris have been replaced with groomed front lawns and pine trees, the € 3 wine replaced with inferior $20 wine, tradis replaced with Christmas dinner rolls, old-world artworks replaced with pale winter sunsets. 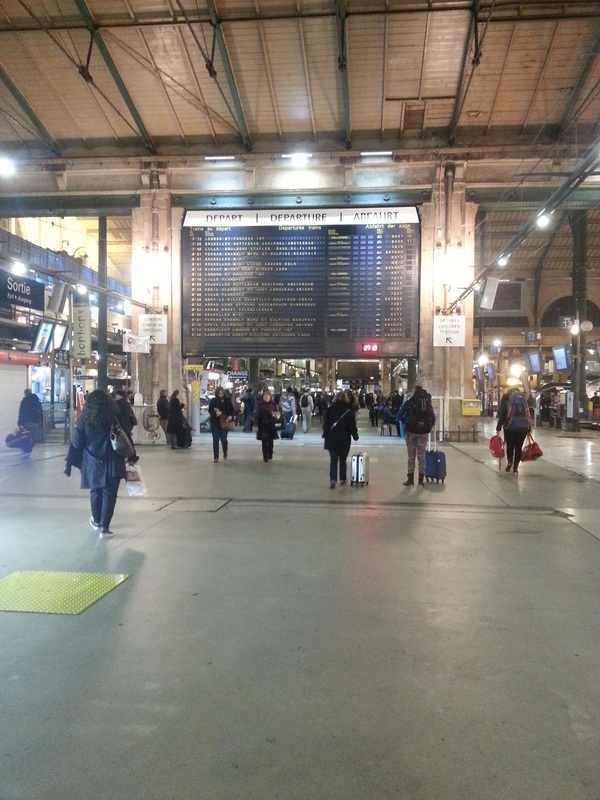 I can’t say I miss Paris at this time though its European charm has a special place in my heart, and for me now represents a time of personal reflection and improvement, stopping to think about art and the world, enjoying long walks and fresh food. My world is instead filled with singing familiar choruses and gazing out on frozen farmland, blasting down the 401, passing small towns that you’d miss if you blink at the right time. Connecting with my roots: both my family tree and my roots in the natural world. I don’t want to say there’s no place like home.. because it infers that it’s better not to leave. When you leave and come back you both appreciate all the things you left home, but bring back many new things, parts of other places that you blend in with your own life, becoming a new person. Your personal makeup now an altered recipe with improved ingredients. Rooftops in the Ward (1924), was painted by A.J. Casson (1898-1992), a Torontonian, member of the ever-loved member of the Group-of-Seven, and the Art Director and Vice-President of my alma mater. This was one of the first paintings I thought of when I got home. The heavy blue blocks of snow covering the rooftops a familiar Canadian sight, but the angular abstraction of the houses I am reminded of when I pass these giant suburban complexes on the highway. 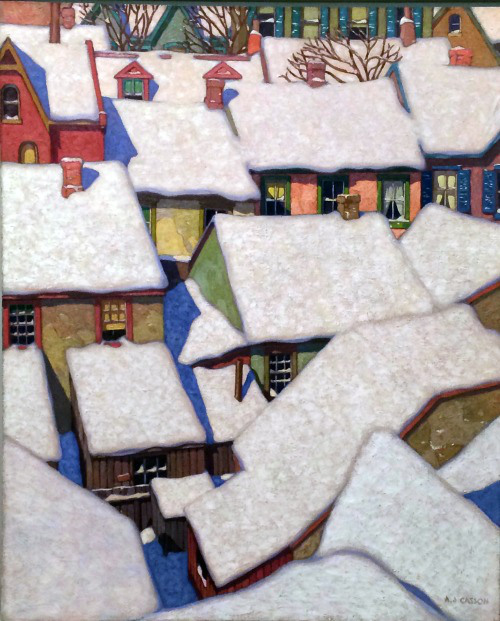 This painting always stuck out to me on the coveted top floor of the AGO, nestled in with fuzzy reduced palate sketches of typical Algonquin landscapes. The anonymity of each building lending itself to feeling familiar to anyone who looks upon it, the gridwork of buildings similar to the view from so many houses, especially in the Big Smoke. “His art distills Ontario […] into highly finished, carefully composed designs, with a stillness that sometimes seems ominous” 1. 1 http://www.gallery.ca/en/see/collections/artist.php?iartistid=935 2 Distel, Anne, et al. 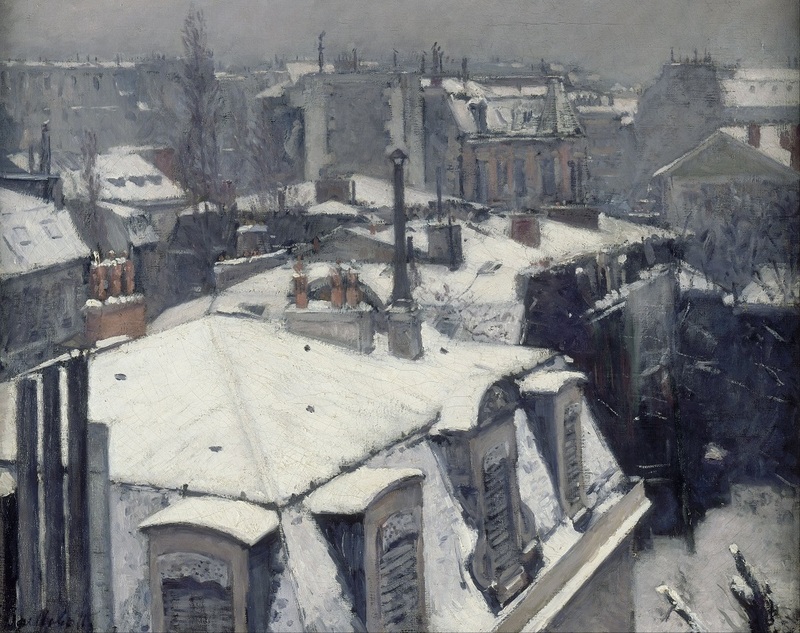 Gustabe Caillebotte: Urban Impressionist. New York: Abbeville Press, 1995. I recently got a chance to spend some time with what might be my favourite painting of all time, View of Delft (Vermeer), 1661. 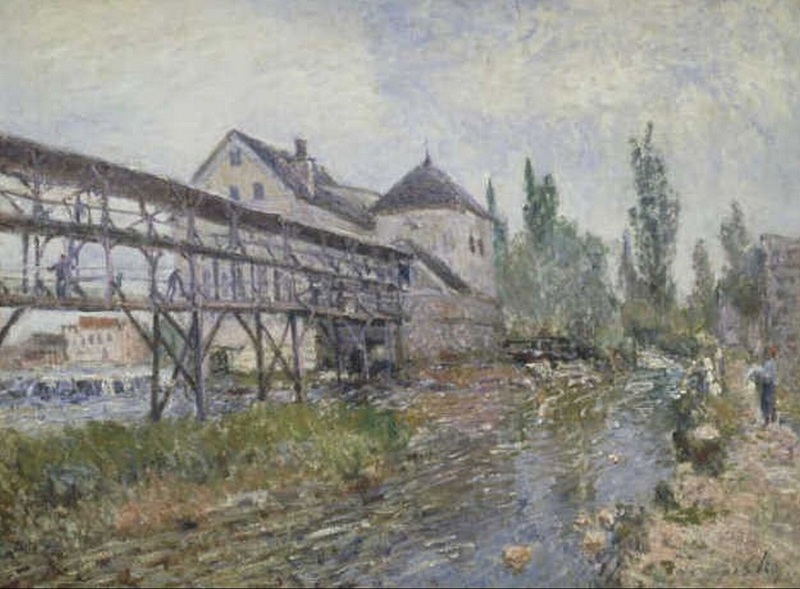 The painting portrays the artist’s hometown, surprisingly much larger than anticipated but complete with every glimmering ripple in the water and every rouge brick expertly painted, and the ever present rolling billowy clouds swathing quarters of the town in shade. In 1661 cityscapes were not a popular scene, paintings of the time usually favoured interior Dutch Genre scenes, so the rareness of such a painting is a gem in itself. What’s amazing about Vermeer is his ability to render scenes in exquisite detail. There are plenty of Dutch contemporaries who have created many fine works of similar quality, but there is something special about Vermeer. There is something that sets him apart from the others, some special relatable quality of his works which pluck at our heart strings. 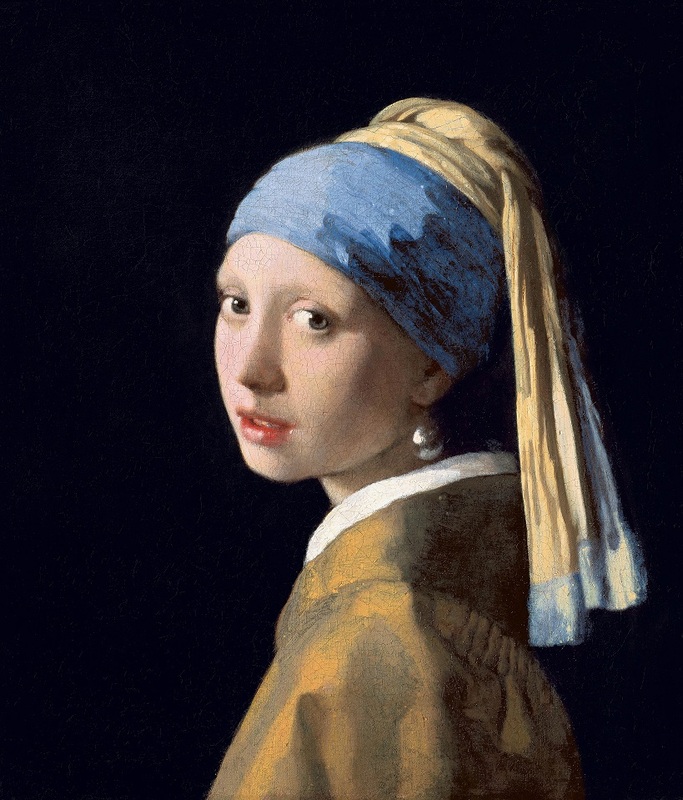 There is hot debate about how Vermeer came to be so amazing, and the amount of evidence and speculation have lead the art community to take choose camps to support and usually battle each other quite viciously. The debate surrounds the notion of Vermeer using visual aids, but frankly the debate comes down to the idea of genius. There is this romantic idea that artists have some special talent that is imbued in them like a magic spell, which gives them superpowers that allow them to create great masterpieces which the general rabble couldn’t achieve, and some argue, can’t even comprehend. You wouldn’t understand, you are not an artist. To suggest that an artist used a device which greatly aided their task tarnishes the illusion that artists have god-given specialness and therefore diminishes the value of the work. Where do we draw the line for what tools are acceptable? Many artists use a grid and rulers to plan their work, to keep it in line with their source material and notions of perspective. If two artists paint nice pictures and one uses a grid to plan their composition, is one really more impressive than the other? What if we aren’t aware which artist used the grid.. does it really matter? Those who believe that aids were used “argued that naysayer art historians dreaded the use of mechanical device, because it would diminish the stature of the artist’s as a creator and, perhaps, a bit of the prestige of the art historians themselves, key negotiators between the artist and the public” 1. The argument of what makes art “art” is very long and convoluted but it is generally agreed that if a work is visually interesting or represents and interesting idea then it has value. Paintings which we can easily relate to the subject and appreciate its accuracy to our reality is a primary basis for judgement, and one that is particularly comforting. The admiration for accurate depictions of reality is long-standing and historically considered to be essential criteria for measuring an artists’ or works’ worth. Vermeer’s drive for visual realism, coupled with his love for ordinary Dutch society allows for a very honest and dedicated civilian cross section. Among his contemporaries you will find a great number of commissioned portraits of merchants or gentlemanly societies, interior scenes with exaggerated debauchery and similar fodder for moral undertones. Vermeer is no stranger to moral undertones yet his are more of a whisper than being knocked over the head with it. His scenes usually depict idyllic domesticity, the sheer timeless perfection of it enough to drive a person to desire the good life. His subjects are painted in utter perfection, in fact so much so that we are lead to believe that Vermeer is either a genius or a cheat to achieve such an accomplishment, and so the speculation begins. One example of Vermeer’s style which suggests the use of aids is the extreme perspective accuracy. Vermeer “could have observed and even been stimulated to sketch the more brightly illuminated images produced at a smaller scale by a portable camera obscura [… however] he could have produced them by using graphical methods taught by his fellow countrymen De Vries and Hondius in conjunction with a well-known technique which made use of a pin inserted at the vanishing point with a thread attached to it and held taut to define the orthogonals of the scene” 2. Using grids and rules to better understand the principles of geometry and perspective is not a secret. Many attempts were made to understand spacial order in Medieval times, ultimately culminating in the understanding of linear perspective developed in the Renaissance. Regardless, for Vermeer, there is considerable evidence that he specifically used optical devices as aids to create paintings. There is, however, no historical or archival data to confirm this notion, including the fact that the detailed inventory of the artist’s belongings drawn up after his death does not include a camera obscura or any similar device 3. Instead, scholars and critics look to the paintings themselves to glean bit of evidence of optical illusions rendered into the work. For example, Daniel Fink built a camera obscura in 1971 to observe objects similar to those found in Vermeer paintings, and observed them in the same conditions that the artist would have as confirmed with historical data. 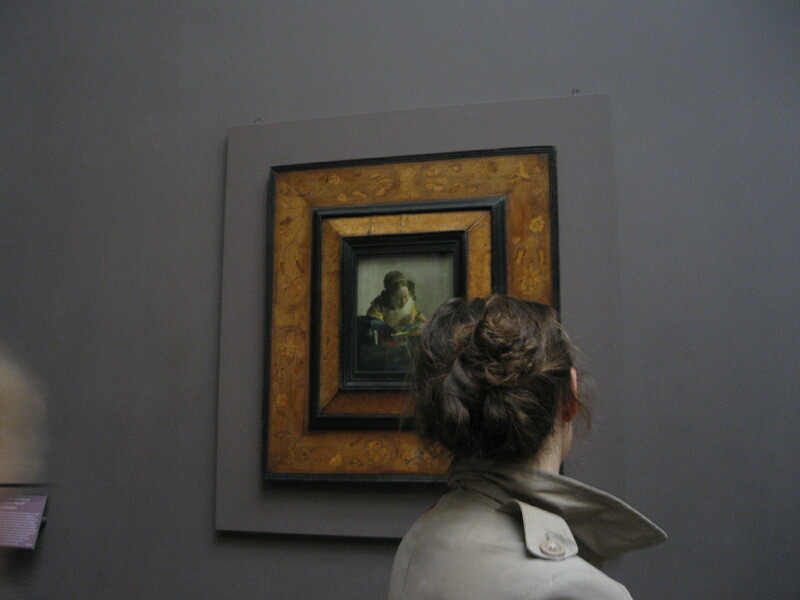 Fink believes there are optical elements directly resulting from a camera obscura in most of Vermeer’s works including but not limited to ; “variations [of]principal planes of focus, halation of highlights, relative detail in still life portion versus figure detail, consistent proportions of the paintings (4-5:5 or almost square), [and] dimensional precision in rendering objects” 4. My research into the optical illusion debate contains many references to the Lacemaker (Vermeer), 1670, so I took a quick trip down to the Louvre to investigate this work a little closer. It is suggested that the unfocused areas of the work are the direct result of lens and/or camera intervention. Furthermore, “maximum highlights glimmer with the so called disks of confusion, or pointillés as they are sometimes called when they are translated into paint. 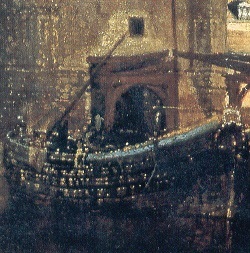 Pointillés, a conspicuous feature of many of Vermeer’s paintings, cannot be perceived with the naked eye and do not seem likely stylistic invention. The are, however, produced by the camera obscura’s imperfect lens” 5. Indeed, many aspects of the Lacemaker are almost abstractly blurred, fuzzy blobs of paint akin to the type of pointillés and diffusion known to us now in the photographic era. Though the use of lenses in the exploration of telescopes and cameras was not unknown to Vermeer at the time, the notion that Vermeer chose to paint certain areas out of focus and certain areas very focused does not prove the usage of cameras and lenses as aids. 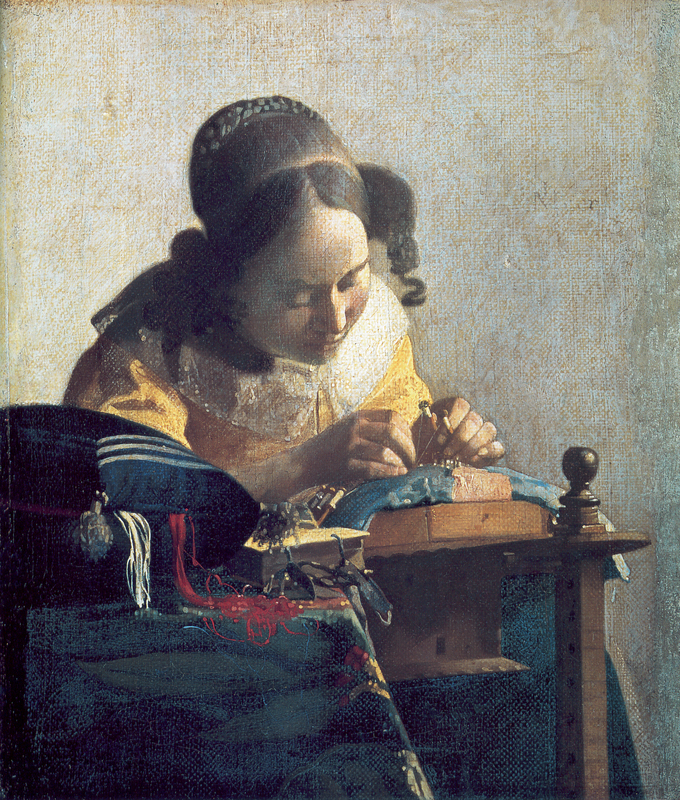 The Louvre’s blurb on the work suggests that it was Vermeer’s genius to paint certain areas in and out of focus to mimic binocular (vision) to provide a livelier portrayal, “reproducing the natural optical deformations of the human eye by creating several depths of field […] the lacemaker’s painstaking work, is shown in great detail and in sharp focus, particularly the fine white thread stretched between the young woman’s fingers. Further away from this visual focus, the forms become more blurred, including, paradoxically, those in the foreground” 6. The use of curved lenses leads us to believe that the choice to have the subject in focus and the fore and back grounds unfocused was simply the work of the device and Vermeer no more than a a simple scribe transferring the information provided into paint. Ie. diminishing the notion of the artistic genius. Similar techniques are employed in the View of Delft; “the pointillist technique that Vermeer used to suggest reflections flickering off the water, most easily visible on the two herring boats on the right, is evidence that he probably used a camera obscura to help compose the picture; diffused highlights such as these would appear when a partially focused image was obtained from this device” 7. It is not beyond the realm of possibility that Vermeer used such device as an aid but it is dangerous when you begin to assume that the use of such device negates all artistic intention. One issue with a camera obscura is that it is obtained by a pin-hole of light entering a darkened room. Read: darkened room. It is very presumptuous to believe, as is presented in the acclaimed film “Tim’s Vermeer” that any old person is able to render what Vermeer did with nothing more than a lens and paintbrush. It is also suggested that Vermeer used an inverted Galilean telescope to create View of Delft. 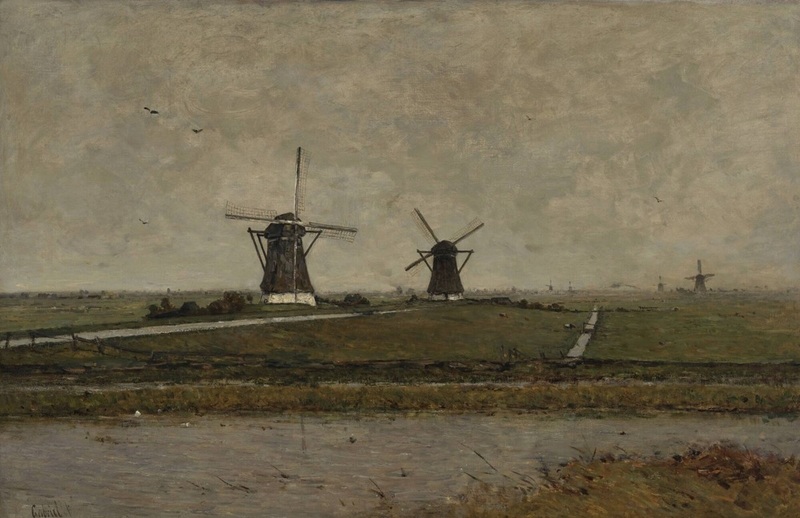 There are peculiarities of the painting which it has been suggested are optical effects that are a direct result of this device, which “condensed the panoramic view of Delft, diminished figures to smaller magnifications than normal and emphasized the foreground” 8. Here there exists a paradox. The painting itself is very detailed and expertly rendered, and if you believe he used optical devices the artist was slave to the conformations of optical devices and had no intention to compose the scene in any intelligent, artistic or creative way. However “in a topographical drawing by Abraham Rademeker (1675-1735), executed about half a century later from a similar vantage point, it is noticeable that the buildings appear taller and crammed closer together than in Vermeer’s picture. Vermeer seems to have shifted the buildings slightly to produce a more harmonious composition” 9. At what point does the artist’s creative genius work in tandem with rendering tools? At what point does the tool make more aesthetic decisions than the artist? The are all questions we find ourselves asking in a more modern era, considering the advent of multiples and auto-creation. Is photography art? Does the artist’s intention, composition and execution of a photograph enough to consider it as meaningful as a painting? Does the camera itself take away from the magic of art-making? Does polaroid take more share in the credit for a famous photograph because it makes certain aesthetic choices for the artist? Warhol explored and challenged the notion of uniqueness and authenticity by developing a factory of artists churning out silkscreens. At what point does a Warhol stop being a Warhol? At what point does the artist’s vision for the finished work get interrupted by the technological aspects of its creation? Andy Warhol’s 1964 “Red Self Portrait” was deemed not genuine by Andy Warhol Foundation for the Visual Arts, even though it was signed and dated in Warhol’s handwriting, and was included in the catalogues of his oeuvre published during his lifetime. Warhol had taken a self portrait in a photobooth, transferred it to silkscreen, delivered it to commercial printers with explicit instruction as to the creation and end result and had them do the work. The simple fact that he was not physically present during the final stage of its creation deems it not genuine by governing authority. The board’s lawyer himself admits “it has to do with the intent of the artist… if Warhol conceived the idea and he then directed someone else to prepare a silkscreen, and he then supervised the process of production and in effect signed off on it, whether or not he signed his name to it, as long as he said, “That’s good, that’s what I wanted,” Warhol created that work”10. Despite the distortions evident in Vermeer’s work, whether or not they were inspired by the illusions of optical devices, there are a number of reasons to give credit to Vermeer as an artist of creative and brilliant foresight. The pleasing composition of the city scene contains both accurate depictions of Delft at that time and invented pictorial division. 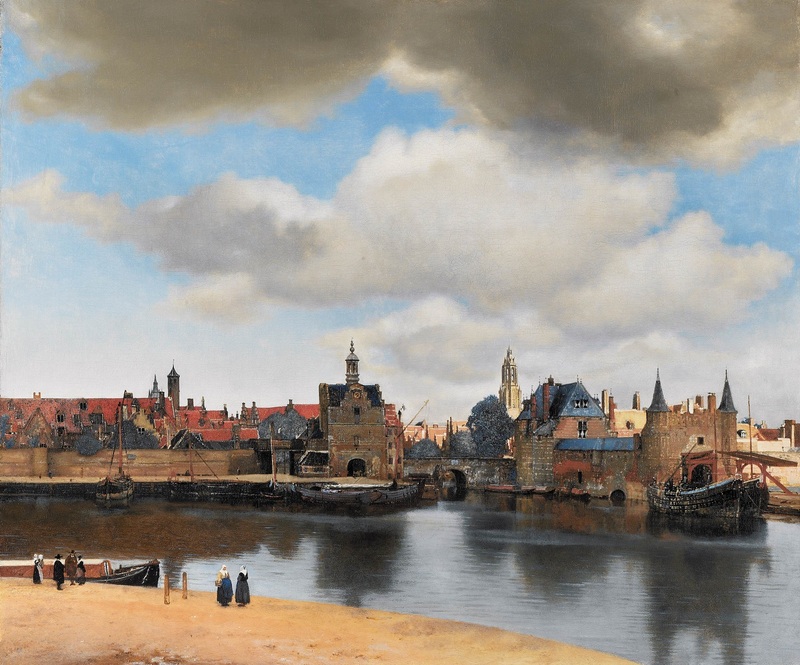 It has been noted that Vermeer intentionally spaced out the buildings to give both literal and interpreted pause and rest between them, despite accusations that an inverted telescope in fact would have condensed the scene. As I believe it is the artist’s aesthetic intent which creates a photograph rather than simple film processing, Vermeer chose the view to portray, as an artist decides when and how to point their camera. “A.K. Wheelock, who originally enthusiastically embraced the camera obscura-Vermeer tie, has backtracked and now holds that Vermeer “must have admired certain effects of color, light, and focus in a camera obscura, but that he persistently departed from what he actually saw in the camera, in his studio, or in another artist’s work in accord with his own highly refined aesthetic and expressive goals” 11. Vermeer’s choice of scale and cropping ends up with a balanced composition hinting the viewer as to the nature of the city itself. Vermeer worked slowly, producing considerably few finished works during his lifetime. His style is meticulously detailed, the treatment of light especially pragmatic and the careful and loving depiction of simple objects elevates the banal to celebrated heights. “The meticulous way that Vermeer worked on this masterpiece is shown by the fact that he mixed grains of sand into some of his paint to achieve a certain texture. An examination of the picture has revealed that the sand was added to the ochre used on the window frames of the long building to the left, behind the ramparts, giving a greater reflective quality to the paint surface” 12. Vermeer’s choice to portray the scene in such a way as to allude to the pleasant and upstanding interpretation of Delft is also evident in the composition of the lighting. 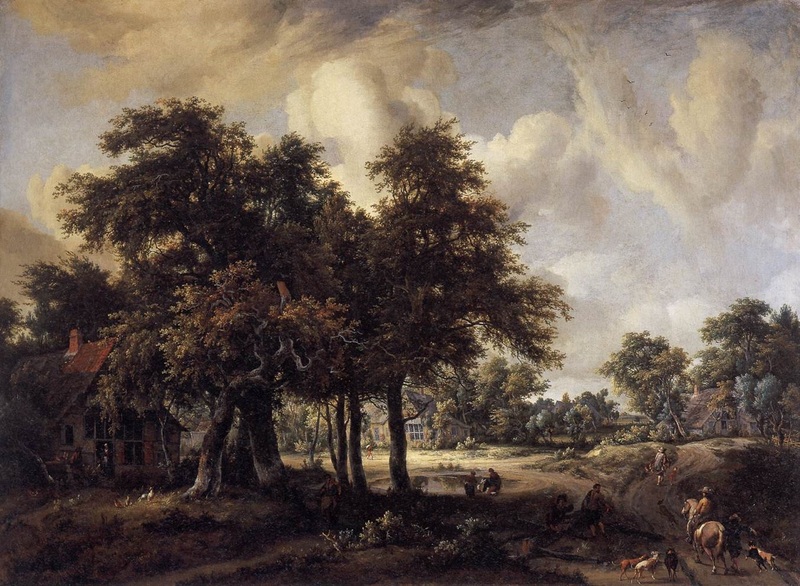 The majority of the scene, as is common with other Dutch paintings, is sky. 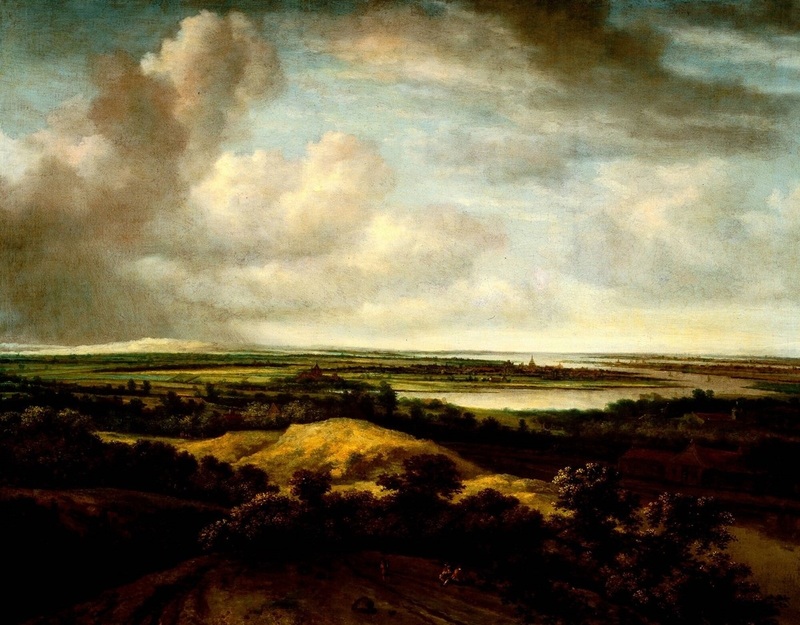 The aesthetic of having compositions predominantly sky reflects not only the pragmatic and protestant Dutch lifestyle but also practical aspect of lowland painting, such as the low areas of land excluding large changes or areas of visual interest, combined with the ever present billowing clouds typical of the region and unequalled Dutch light, said to have a unique quality. “Historically, the Dutch maintained a unique and tangible relationship with their land, quoting a popular Dutch saying: ‘God created the world, but the Dutch created Holland’ 13. 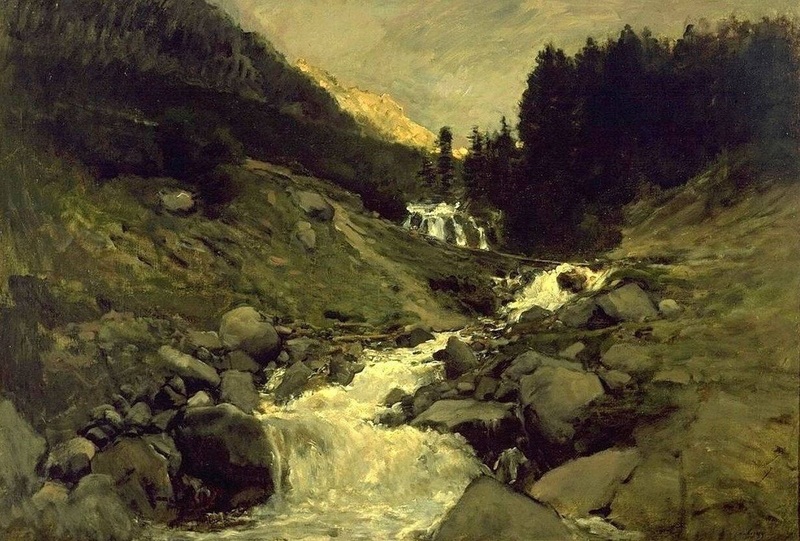 The large dark clouds swarm the top of the scene, giving the viewer respite from the bright light of the sun. The immediate areas of town are shaded yet clear and rich in colour, perfectly crafted. The congestion of the town as is recedes into the background stunningly highlighted by the sun’s break from the clouds, brilliantly illuminating the New Church. Vermeer aspired to portray “View of Delft reflects Vermeer’s concept of beauty and the prominent churches could be a subtle reinforcement of Christian morals and values of this time. It could also be that by painting the Old Church in shadow and the New Church in sunlight that he was portraying the city’s spiritual growth” 14. The more scientific explorations of Vermeer’s secrets comes up with more and more complicated conspiracy theories. 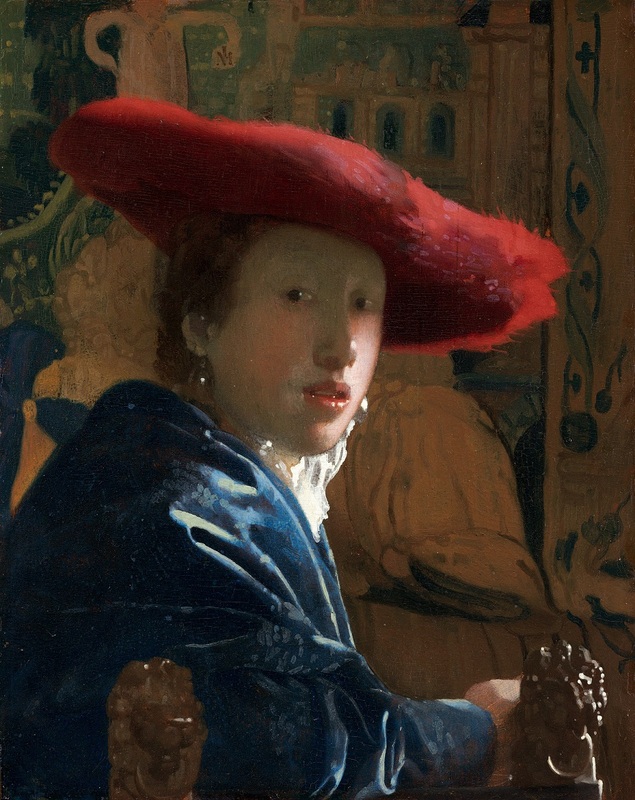 There are undeniable peculiarities in Vermeer’s work which correspond with effects from optical devices that would have been available to him at the time, though there is no evidence to prove he ever owned any. Even if he did, so what? Even if he looked at his subject through a lens or a telescope, passing the light through lenses to be able to see the subject’s detail more closely and to be better able to passionately dedicate this information to paint. Vermeer made around three paintings a year, dying in young poverty and relatively unknown outside Delft. We still know that he employed the most expensive pigments at a far greater quantity than his contemporaries, spending such exorbitant amounts of time on each painting making any kind of decent wage is outside the realm of possibility. His dedication, however, is key to his genius. If Vermeer used optics, well so what. It may have been another tool in his toolkit, another instrument to employ in his endeavor for, and ultimately his success in perfection. 7, 9, 12 Bailey, Matin. Vermeer. London : Phaidon Inc., 1995. 8 Ferguson, Rex. Criminal Law and the Modernist Novel : Experience on Trial. New York : Cambridge University Press, 2013. 13 Gold, John R, George Revill. Representing the Environment. London : Routledge, 2004. Sometimes you go on vacation for so long it becomes very regular, like home. You grocery shop at your regular store, you work, you go out sometimes with friends. So sometimes you need a vacation.. from your vacation. The nice thing about being in Europe is the ability to hop a train for a modest fare and end up two countries over, two hours later. So it is with the Netherlands, my most cherished vacation spot, a place a few years ago I thought I would never go and now have gone twice. It calls my name, equally nice in the fall as it is in early summer. The clean air North Sea air breezes through town as the easy going locals zip by on bicycles usually with a partner hitching a ride sidesaddle on the back. 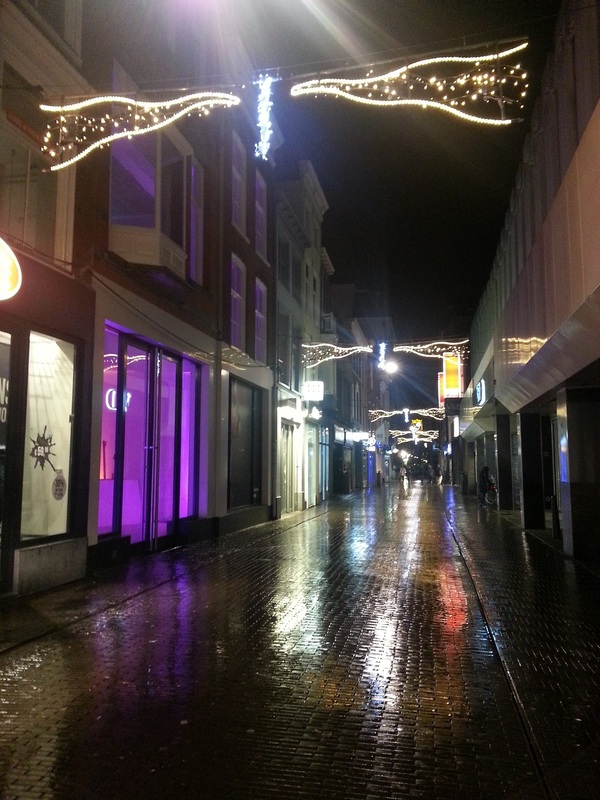 Many a kind and smiling face greeting me around town, the gentle tune of the melodic Hague church bells like a pleasant memory floating through the air to greet me through the patches of ever-drizzling rain. I don’t think it stopped raining the whole weekend, though my spirits couldn’t be dampened. We hopped over just for the weekend so say hello again, snack on street food and acquaint ourselves with the newly re-opened Mauritshuis museum in den Haag. I was tempted to see the collection last year as it toured while the museum was under renovation. The closest stop was New York and it was a very tempting 12 hours away, though I’m glad I didn’t because getting to see the works in the new space was a real treat. 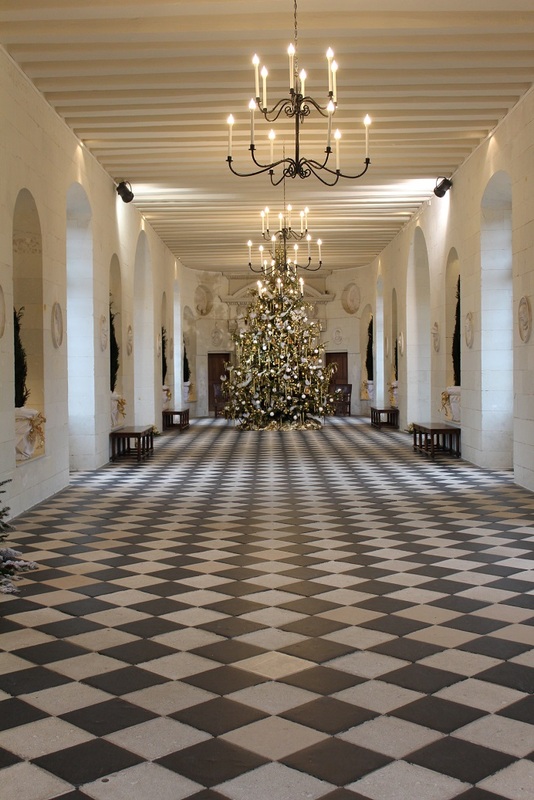 The Royal collection is small, compared to the massive retrospective department-stores-of-museums in Paris, and is housed in a 17th century residence, now owned by the government of the Netherlands. 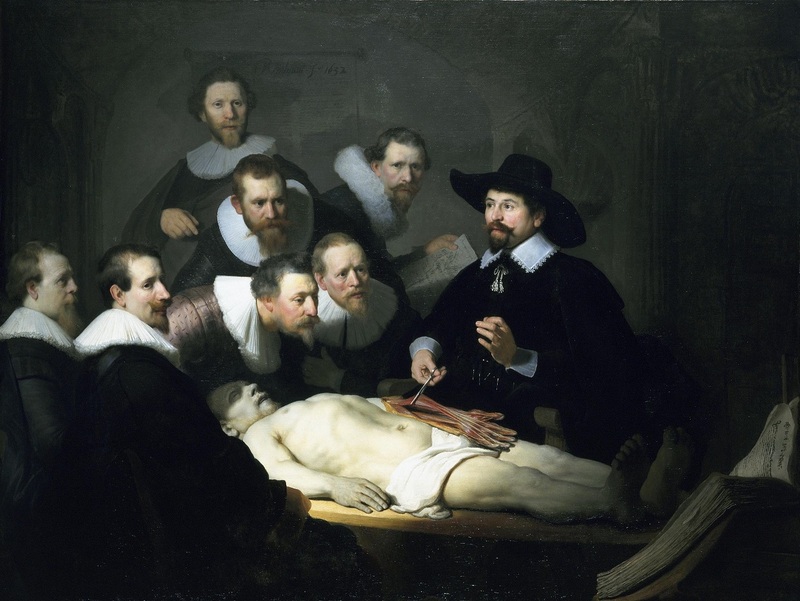 The museum houses a stellar collection of paintings, mostly Dutch Golden Age, including some very famous favourites such as Vermeer’s Girl with a Pearl Earring, Rembrandt’s Anatomy Lesson and Fabritius’ Goldfinch. The museum was absolutely packed, especially with snooty art types like me who refrain from snapping selfies and linger in front of works contemplatively scratching their chins. They were also all above a certain age.. I won’t say which. The only way in which the flighty consumer types that normally frequent the said massive retrospective department-stores-of-museums in Paris are superior, is that you can bet that they won’t spend more than 2.6 seconds in front of a painting, so if you want a look, you just have to wait around for your turn. With snooty art types this could mean waiting for a very long time. That’s okay though because there were a number of truly excellent works that I could just stand in front of all day.. well at least until my legs fall asleep. There were a number of works which I have never seen before, and it’s always nice to make new friends and be surprised. I’m afraid my SO is rapidly becoming my artist’s assistant, helpfully scribbling down titles and observations for later digestion. 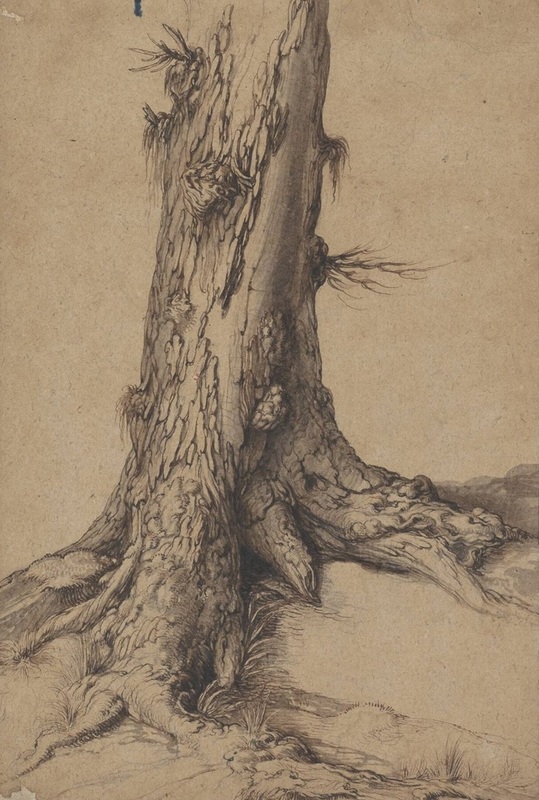 My notebook came home full of Vermeer, Rembrandt, Claesz, Jordaens, Leyster, Rubens, Steen, Hals, as well as some new pals such as Beuckelaer, van der Weyden, van Aelst, ter Borch, de Vlieger, and Hobbema. 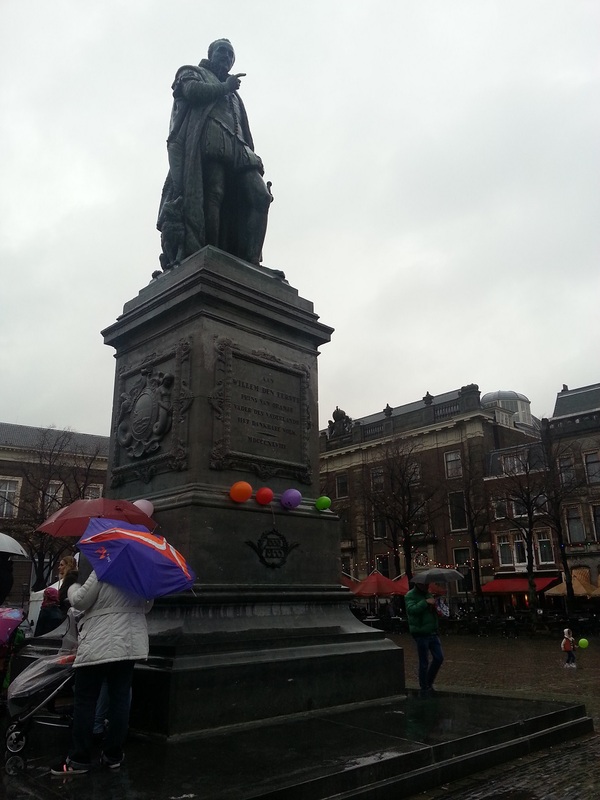 Retiring from the Museum we shopped around the slick cobbled pedestrian streets of den Haag, checking out the celebrations leading up to St. Nicholas’ day on Dec 5th, featuring Sinterklaas (Santa Claus) and his racially inappropriate sidekick Zwarte Piet. Zwarte Piet’s origins lie somewhere between a liberated Ethiopian slave to Moorish origins, to the more modern preference of his helpful little face blackened with soot from climbing down chimneys. Regardless local folks seem to like dressing up in Victorian garb and blackface playing carnival music and tossing candy out to the little kids.We followed this parade from a distance, trying to figure out what was going on until we stopped for nieuwe haring and the folks behind the counter explained the tradition to us. Similar to traditions back home, children leave shoes by the fireplace on St. Nicholas’ eve in hopes of waking in the morning to find a treat inside in exchange for good behaviour. Though if you’re naughty you don’t get a lump of coal you get beaten with a switch by Zwarte Piet. The children usually leave out a carrot or some hay with a thoughtful bowl of water for Sinterklaas’ horse, a cup of coffee for Sinterklaas and a beer for Zwarte Piet. Despite the fact that traditionally Sinterklaas was accompanied by just one Zwarte Piet we have Canadians to thank for throwing a Sinterklaas party after the liberation of the Netherlands, encouraging a whole slew of Pieten to roam the streets. We departed our rented flat early on Sunday, forgoing a cold shower as the hot water heater was inoperable, and strolled up to the so called best coffee in the Netherlands. 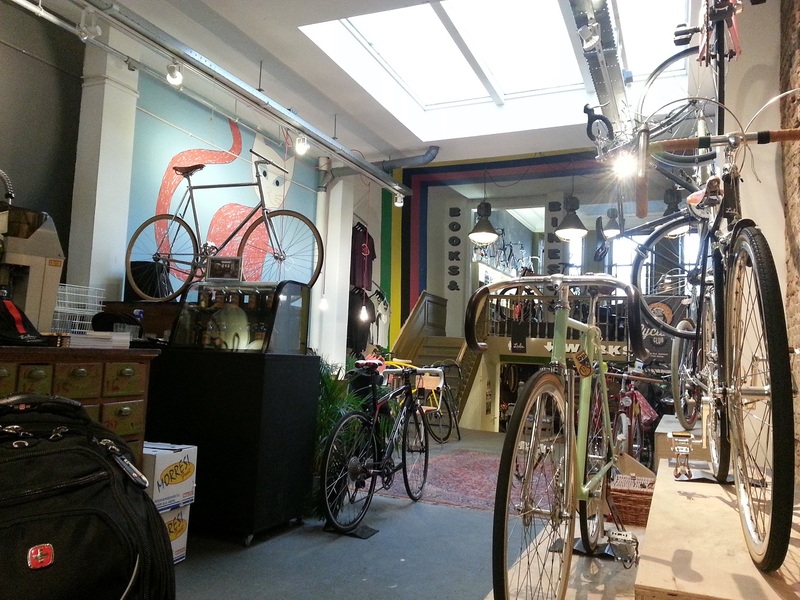 It also doubles as a serious bicycle store because, hey, you can pursue two passions at once. SO had a good time checking out all the bikes and gear, pointing out the superior composition of the metal in particular bike gears or somesuch. I decided I liked the pink one for.. reasons. The coffee was truly excellent and we happily lingered way longer than intended. 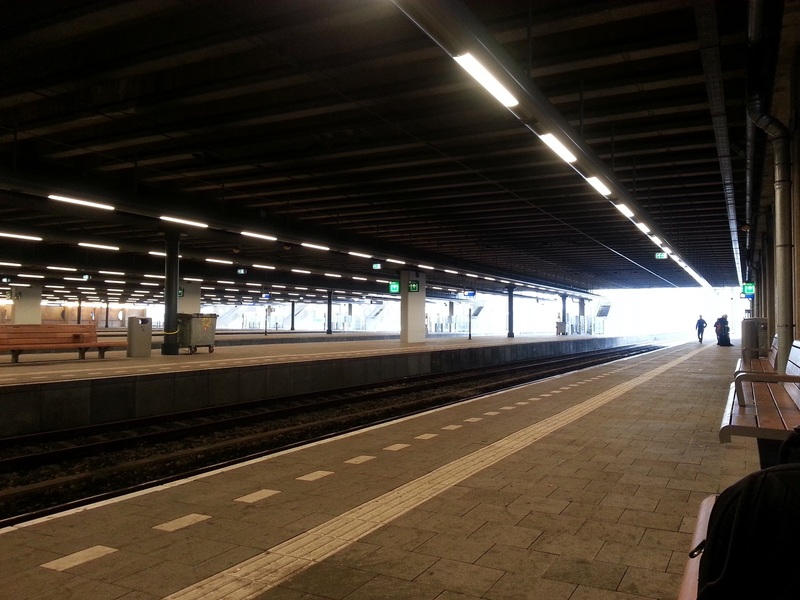 Back on the train we traveled to nearby Rotterdam to check out the town and the Museum Boijmans Van Beuningen. Rotterdam has a very different feel, the majority of the buildings very contemporary with lots of skyscrapers. 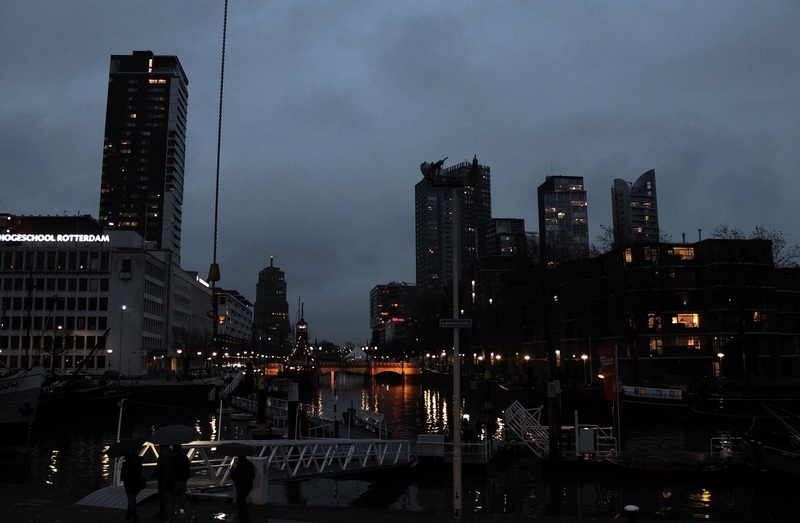 A huge amount of old Rotterdam was destroyed by bombing and subsequently rebuilt in modern fashion. The city has much less warmth and character somehow, probably a figment of my imagination as I’m known to be very sensitive and have a tendency to personify and anthropomorphise. Boijmans is a huge museum with a very diverse collection, ranging from medieval to contemporary and every facet in between. 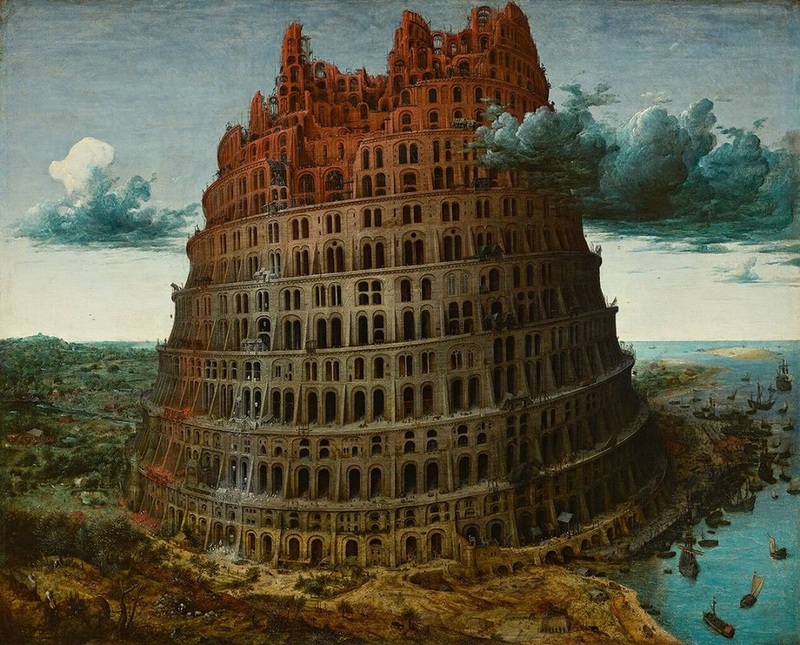 It has a lovely selection of Bosch and Bruegel, including the famous “little” tower of Babel and the Wayfarer who is said to be choosing between debauchery and virtue. Some other favourites of mine include van Dalem, Koninck, Havicksz, and Daubigny. 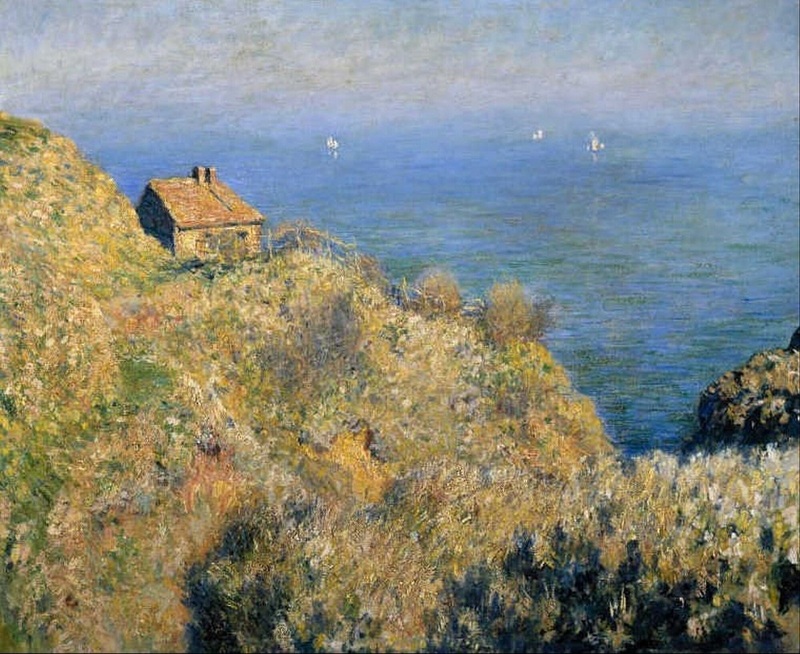 The museum also houses a very nice selection of French Impressionist works including featuring a nice but unusual Monet “Maison du Pêcheur” featuring a very nice seascape with cabin on a very uncomfortable angle lending the impression you are in some danger of leaning too far into it. 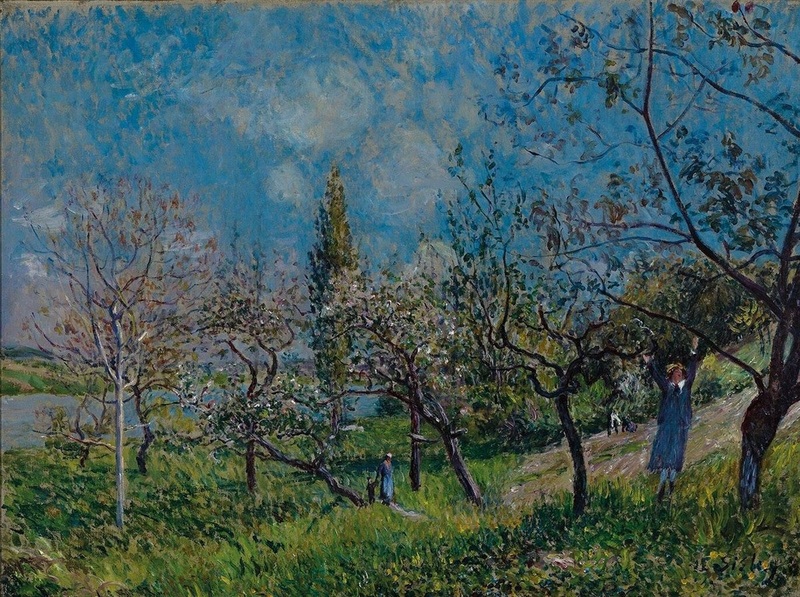 The collection also houses some very nice works by Sisley, who is rapidly becoming a favourite of mine. 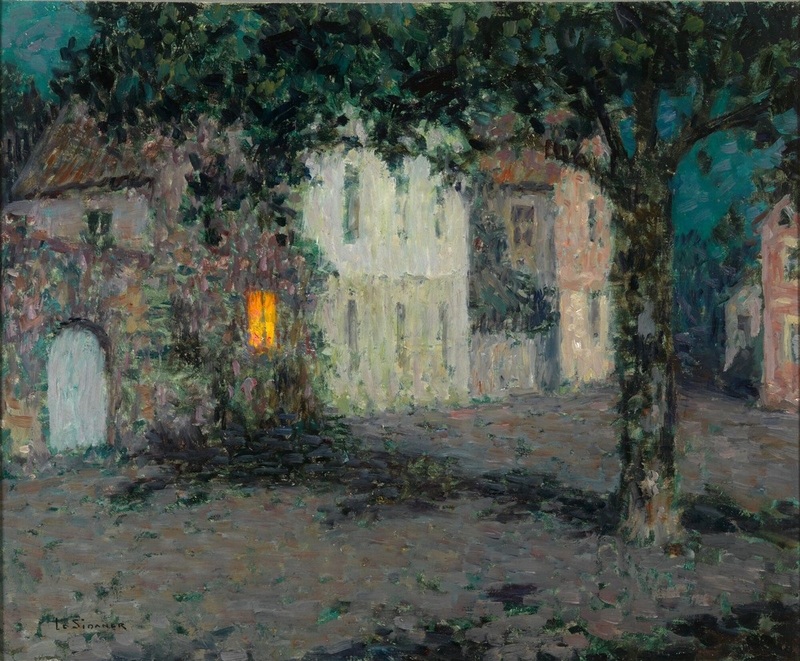 A bit father down in the collection there is a really nice Sidaner, an intimist painter whose “moonlit city square” is expertly illuminated, and its quiet volumes of night shades a rare achievement in my opinion. Apart from the very broad range of styles and endeavours there is also a lovey collection of very modest floral still lives which are uncomplicated, delicate, and very lovely. Remembrance day in Canada is always a solemn affair. It is a day that we have the opportunity to remember our history in all its pride, tradition, pain, misery, honour, and anguish. It is a bittersweet mixture of mourning and pride stirring our hearts in awakening the memory of war and to honour those who have participated and continue to participate. In Canada, Remembrance day is quite solemn. It is with a modest gesture we salute our armed forces and heavy hearts we recall the sacrifices made and struggle we have endured. “The glorious dead” is emblazoned on many a monument but our celebrations are notably quiet, our moment of silence unwaveringly enacted. I think this is the first Remembrance day that I haven’t been in my native country to participate in. Canada and France have a long history from the new world’s perspective and our alliance in the world wars led me to believe that Remembrance or Armistice day would be similarly marked in both countries. This is not so. 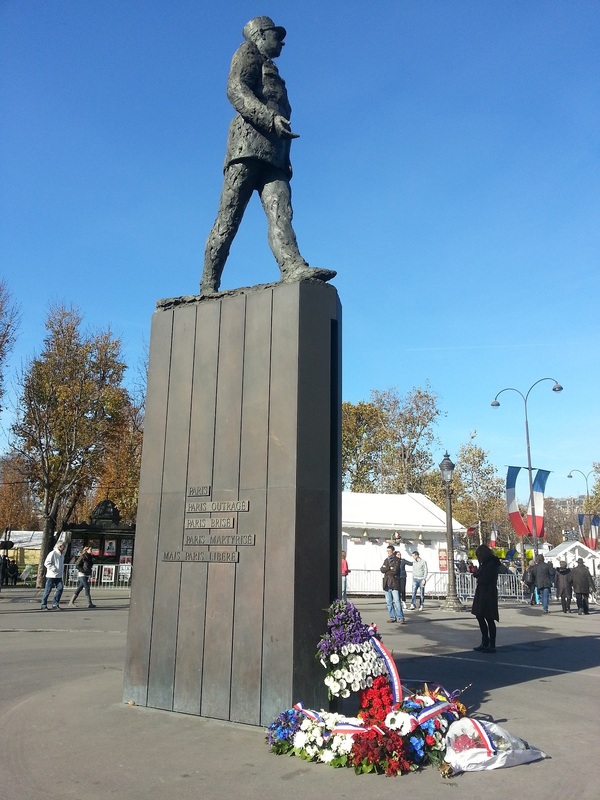 I’ve found in France that war memorials are marked with pomp and circumstance, the bloom of flags and pressed formal uniforms accentuated with the shiny and full sound of brilliant marches. It’s more than national pride, it’s a celebration. People are happy! For the French armistice day means something quite different than to us Canucks. It’s the day that the invading forces are banished from their land. The bombing of their hometowns ceases and their life, land and culture once again preserved. Back home we are reminded of the losses suffered. The folks who crossed the sea to foreign lands but never came back. It’s memory is earmarked with the chilling boom of guns and silent contemplation, abstaining from over-glorification. 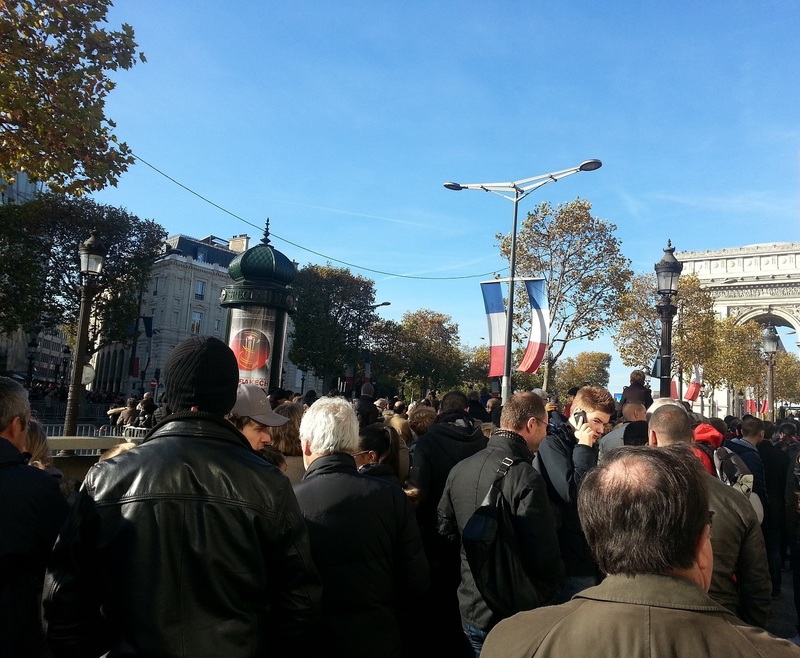 We attended the Armistice day celebrations around Arc de Triomphe, where there would be marches, parades, speeches, silence, trumpets, flowers and wreaths. Strangely enough the pomp is reserved for the President and a few distinguished brass who get to sit in the few ringside seats available. The rest of the rabble are blockaded from participating, corralled into pens a block away who hold up their iPads to try and catch a glimpse. There is no silence, there is no formation or bowed heads, there is no confetti or salutes. Most of the people who showed up spent their time laughing and sitting on eachother’s shoulders snapping blurry pictures and smoking cigarettes. The combination of the regal pomp and the distracted pseudo-celebration was a disappointment indeed. 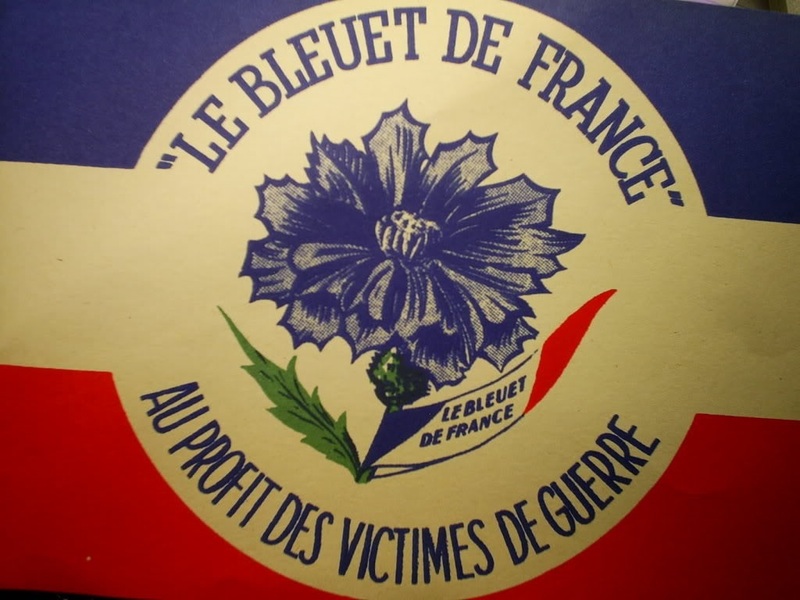 One interesting thing I discovered was the the bleuet de france – cornflowers worn on lapels instead of the poppy. The tradition is the same in that cornflowers grew easily in the land destroyed by shelling. It also hearkens to the term “bleuets” who were the young conscripts who donned the blue uniform which replaced the red pants worn by older soldiers, so the term refers to these men, their youth and their naivete. The practice of wearing cornflowers on lapels comes from 1916 in which war wounded were given the task of manufacturing these badges to provide revenue to wounded veterans, and later became a symbol of rehabilitation. It also serves as an alternative to the Poppy, which many fear is becoming too commercial and losing its integrity. In a mad rush to check things off my must-do list, I took a quick trip to les Invalides. Originally a hospital and retirement home for war veterans, now also has the Musée de l’Armée, Musée des Plans-Reliefs, and the Musée d’Histoire Contemporaine, as well as the burial site for Napoleon and other war heros. 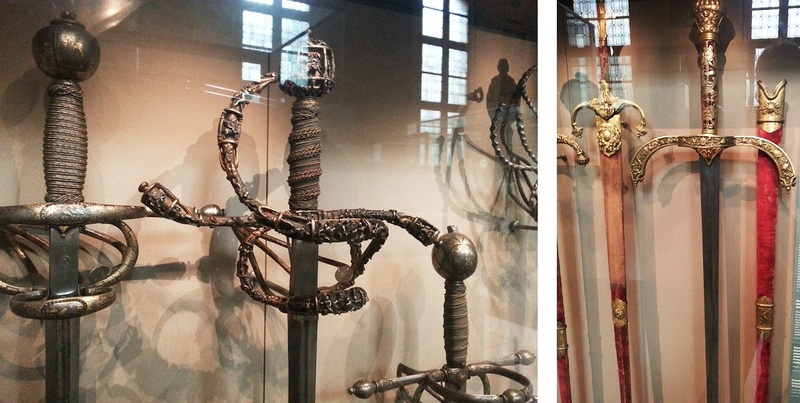 I ended up checking out the ancient armour and weapons wing (13th – 17th century) as well as the two world wars wing. The ancient wing has a dizzying collection of pistols, rifles, cannons, longswords broadswords, daggers, rapiers, épées, clubs, maces, longbows, crossbows, spears, pikes, halberds, etc. 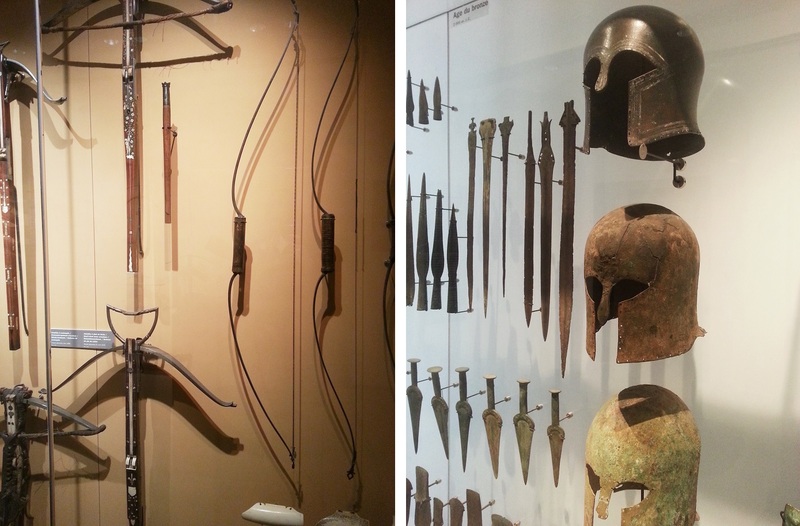 The museum has an amazing collection shown in chronological order so you get to see the changes in warfare over time and the modifications in weaponry and armour. 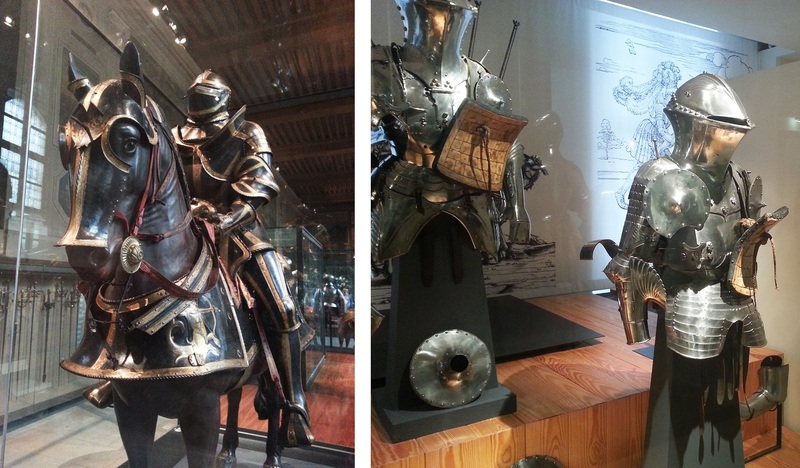 They have an extensive collection of full sets of armour, rooms and rooms of shiny knights. You can even peek into their warehouse where there are shelves going on forever with thousands of pieces tagged and shelved. They had a few examples of chainmail and scale armour though the majority was plate, with many examples of different helms each looking more cumbersome than the last. I liked the bassinets because the pointy face part was sometimes modeled into the face of a snarling dog or somesuch. The other wing I visited is dedicated to the two World Wars. 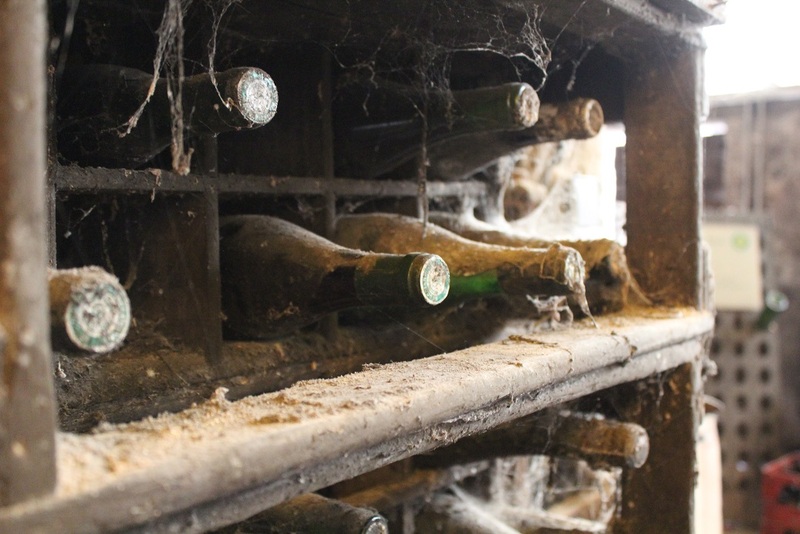 Like the ancient wing it has an extensive collection of weaponry, uniforms and artifacts from over France’s military history between 1871 and 1945, as well as an extensive collection of artifacts from the two World Wars from all participating countries. It was quite interesting to see the evolution of the french uniform from the colourful and ornate in the 19th century into the practical fatigues of the 20th. 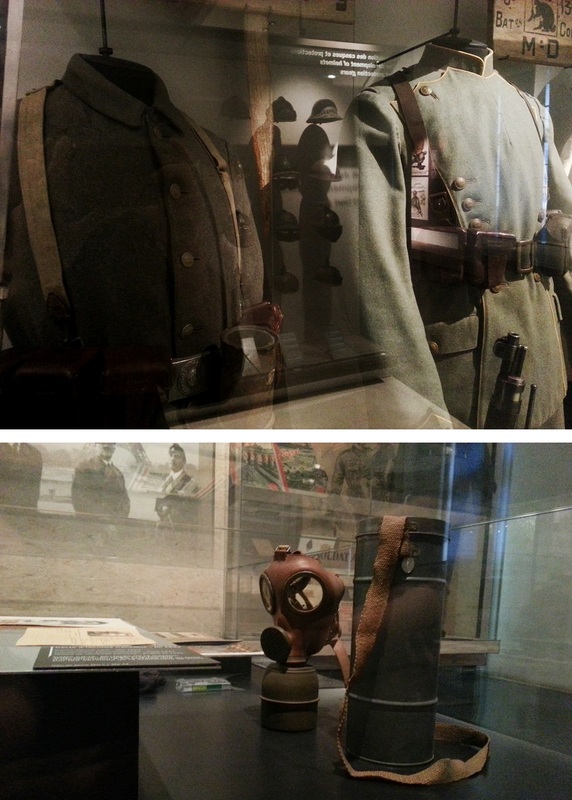 The collection also houses many paintings, letters, postcards, photographs, weapons and artifacts. One part I really enjoyed was a collections of glass cases, each containing everything a soldier was issued, each case belonging to a different country. Everything from the uniform and equipment to cigarettes and wound tablets. 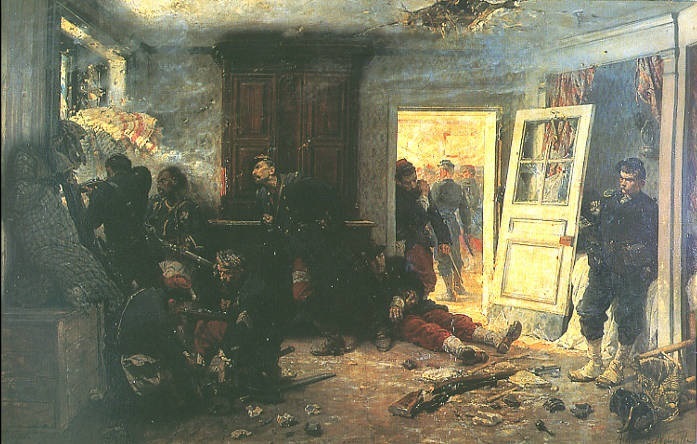 The most amazing part for me was the fragments of a panorama illustrating the battle of Rezonville, created by Alphonse Neuville and Jean Bapitiste Détaille in 1882. 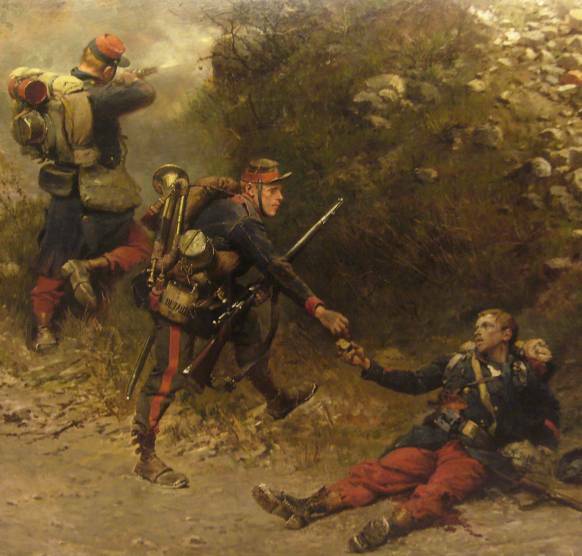 The panorama was originally 9 x 120 m shows “the heroism of the French troops while showing the extent of the battlefield where winners and losers are confused” 1. Thought to be a Republican propaganda tool it was cut up into sections and sold at auction. The museum has a number of these, shown with a diagram of where they appeared in the panorama. They are incredibly vivid and moving, heroic, both inspiring and abhorrent at the same time. It is a shame not to see the entire thing. We also checked out the Grand Palais’ first installation of their Hokusai exhibit, which was wonderfully done. The lighting and the layout amazing, the delicate works being displayed in such a way that it was easy for to view with negligible damage to them. 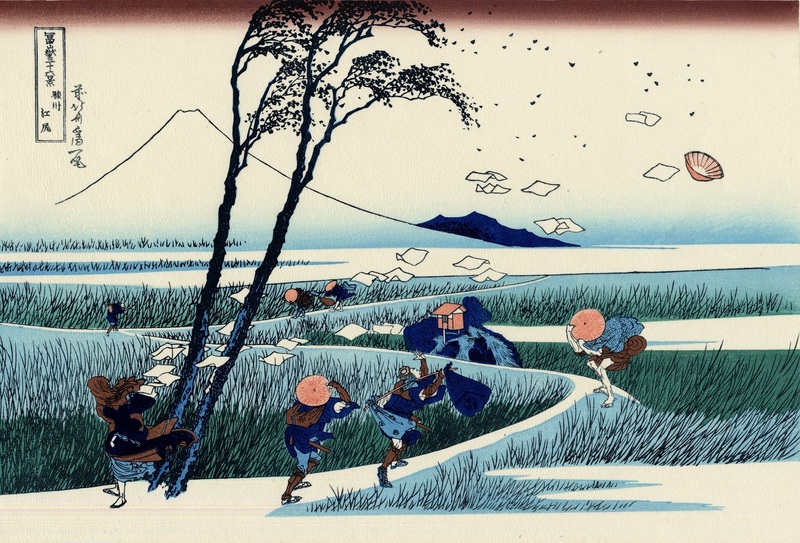 They organized the collection chronologically, which helped see the progress and change in Hokusai’s oeuvre. They also had the majority of the pieces in the series 36 View of Mt. Fuji, in which you all will recognize the Great Wave off Kanagawa, but it was truly fantastic to see the other works in the series which often get pushed aside in favour of the wave, such as Mishima Pass in Kai Province, Tea House at Koishikawa – the Morning after Snowfall, and Ejiri in the Suruga Province. 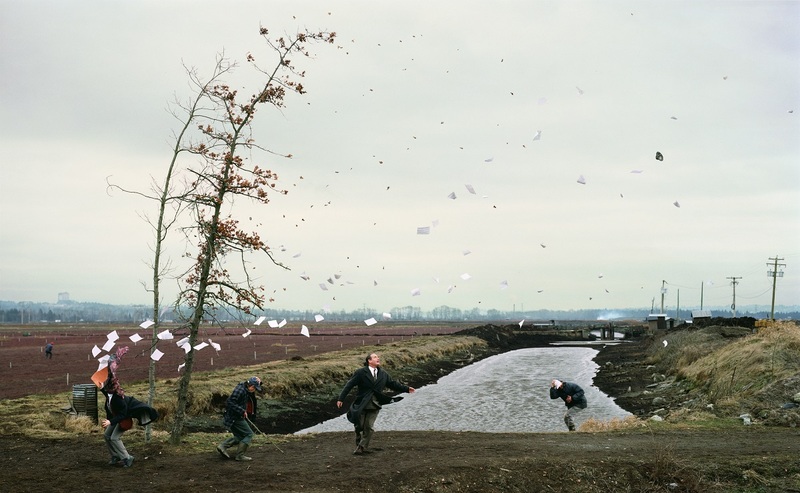 For you art buffs, you might recognize Ejiri in the Suruga Province by Jeff Wall‘s famous work after it: a Sudden Gust of Wind, 1993. 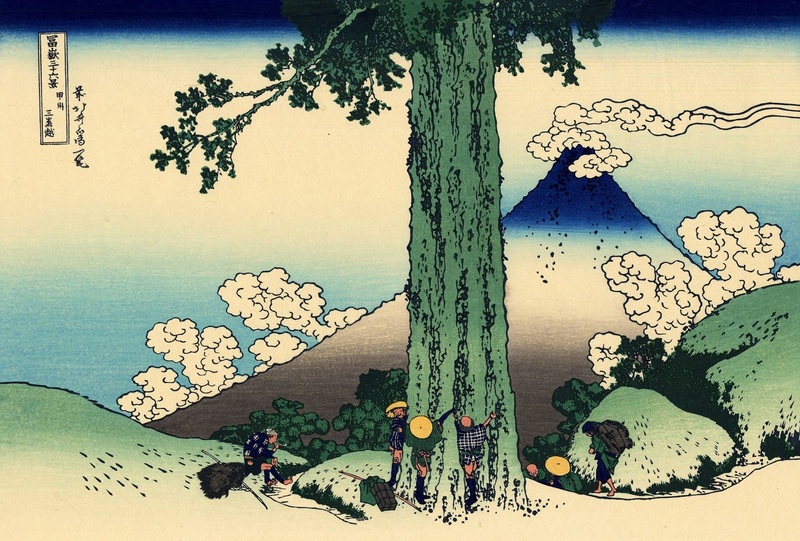 For those not familiar, Hokusai is a Ukiyo-e painter, which means “pictures of the floating world”, a genre aimed at the wealthy merchant class depicting scenes of their indulgences ie) kabuki theater, sumo, travel and landscape, courtesans and geisha. 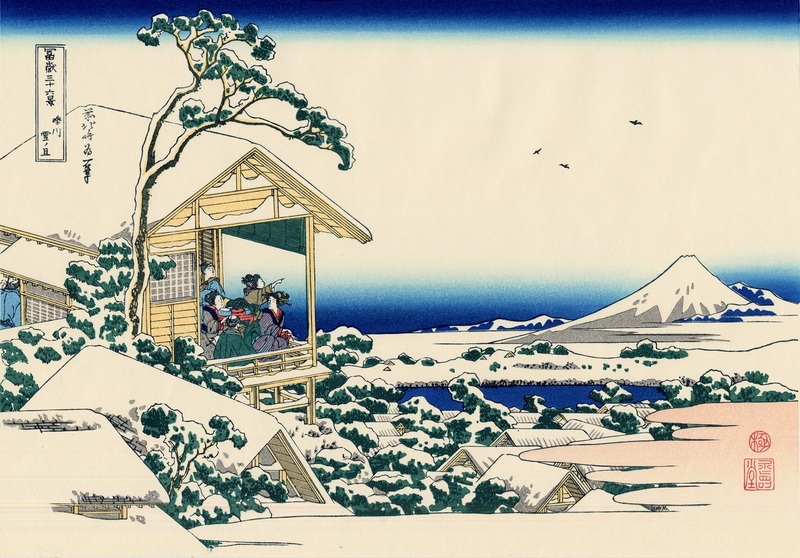 Hokusai explored many styles during his 88 years, namely the traditional Yamato-e style, which often show the beauty of nature with famous places or seasons. The style of Yamato-e is a balanced mix of carefully detailed elements and blank or vague areas. 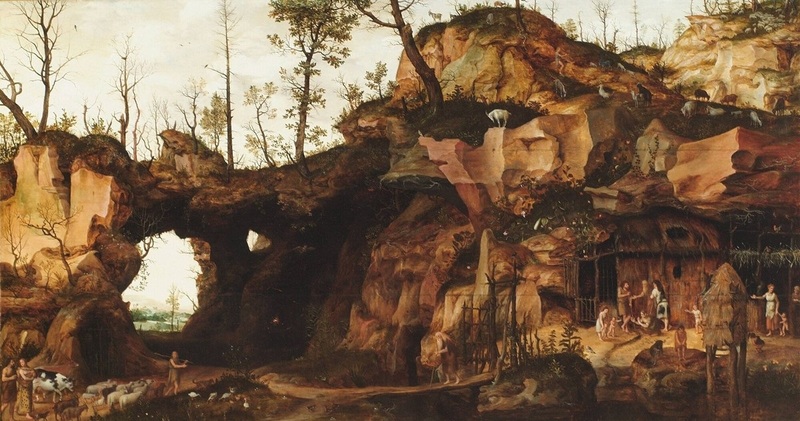 Often these scenes are organized isometrically, giving an oblique view from above, but without the diminishing perspective lines gives the viewer the sense that they are not part of the scene but are looking in at the world.